Wednesday 30th September 2015 – 9.45pm – Claire Brown. 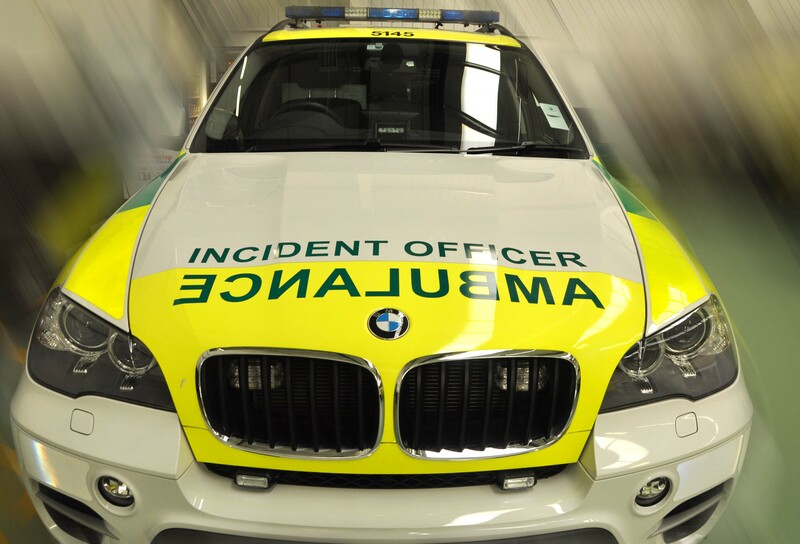 A mother and her young son have received pre-hospital trauma care at the scene of a reported collision in Smethwick earlier this evening. 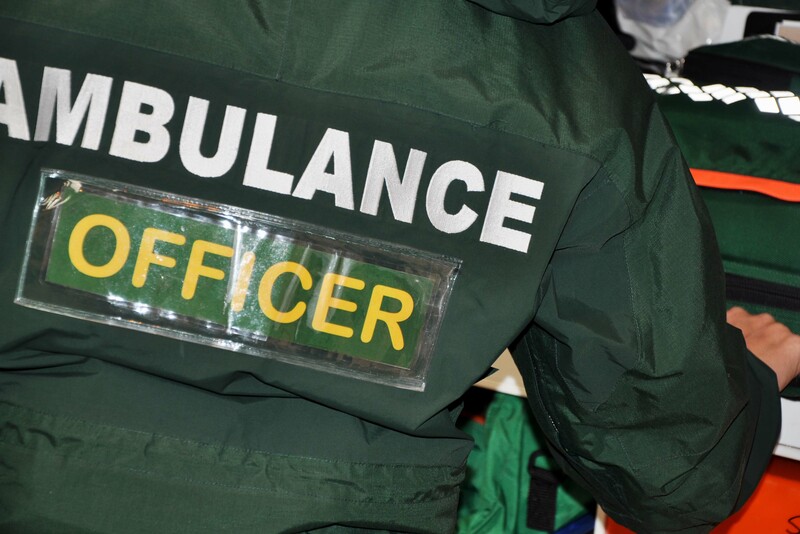 West Midlands Ambulance Service was called to reports of a collision involving two pedestrians and a vehicle in Trinity Street, Smethwick at around 7.40pm (Wednesday). Two ambulances, a paramedic area support officer, a MERIT trauma doctor and a critical care paramedic attended. A West Midlands Ambulance Service spokeswoman said: “When crews arrived they found two pedestrians, a mother and her toddler son, who had been injured and were in the street. An initial medical assessment found that both had a reduced level of consciousness which were of a concern to ambulance staff and the doctor. The woman, believed to be in her 30s, had a bruised and cut head as well as an injury to her arm. The little boy, whose condition was more of a concern to ambulance staff, had sustained a suspected head injury. Wednesday 30th September 2015 – 4.20pm – Jamie Arrowsmith. A car driver was left suspended in mid-air after his vehicle smashed through roadside railings before coming to rest on its roof. Having left the road, the car travelled up a grass bank before being thrown into the air this afternoon. As well as landing on its roof, the car also ended up facing the wrong way on the road with the driver hanging by his seatbelt inside the vehicle. The incident, which took place just after 1.35pm, took place at the entrance to a business park, next to the slip road for junction one of the M69 near Coventry. A West Midlands Ambulance Service spokesman said: “Crews were told that the vehicle was travelling at high speed when it left the road before it flipped over after travelling up a grass bank, which is approximately 8ft high. “Bystanders had assisted the driver, a man in his 20s, in getting him out of the vehicle prior to our arrival. “He was assessed and treated for a head injury and neck pain as well as being immobilised with the use of a scoop stretcher, neck collar and pelvic binder. West Midlands Ambulance Service sent an ambulance and a paramedic officer to the scene. Wednesday 30th September 2015 – 9.30am – Claire Brown. A man has died in a road traffic collision in Warwick in the early hours of today. 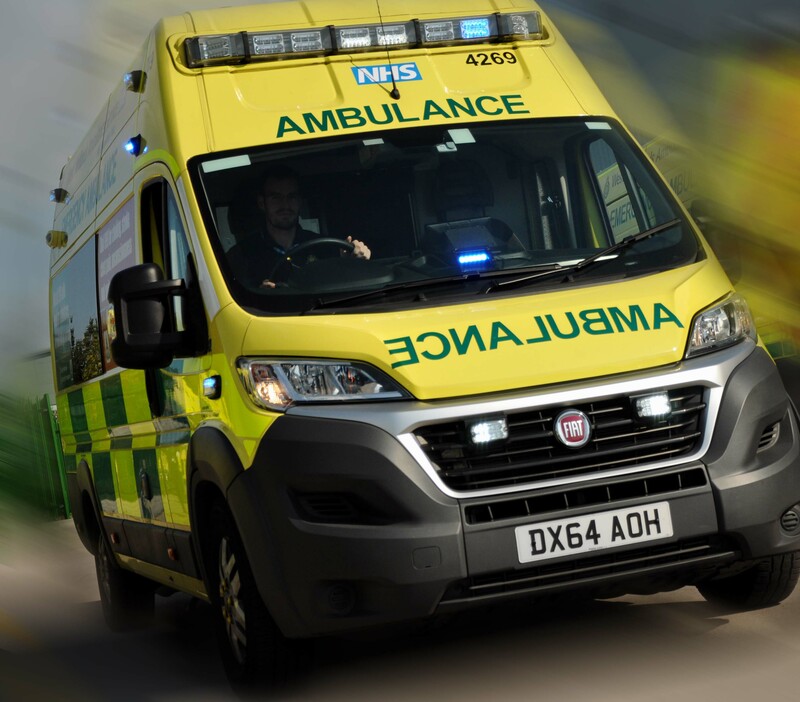 West Midlands Ambulance Service was called to reports of a collision between a pedestrian and a minibus in Europa Way in Warwick at 3.40am this morning (Wednesday). A West Midlands Ambulance Service spokeswoman said: “Sadly, it quickly became apparent to crews that nothing could be done to save the pedestrian, a man, and he was confirmed dead on scene. “The driver of the minibus, a man, and his four passengers were assessed on scene but did not require hospital treatment. Wednesday 30th September 2015 – 7.45am – Claire Brown. Despite the best efforts of ambulance staff, a man’s life couldn’t be saved after the car he was driving collided with a tree and lamppost in Dudley last night. 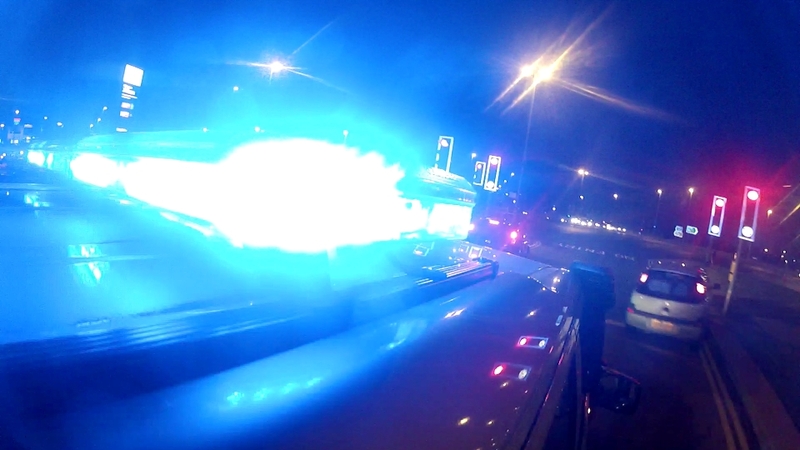 West Midlands Ambulance Service was called to reports of a single car which had left the road at the junction of the Birmingham New Road and Priory Road in Tipton, Dudley at 10.20pm (Tuesday). A paramedic area support officer and two ambulance crews attended the scene. A West Midlands Ambulance Service spokeswoman said: “When crews arrived they found a car which had suffered extensive damage. The driver and passenger had managed to get out of the car unaided. 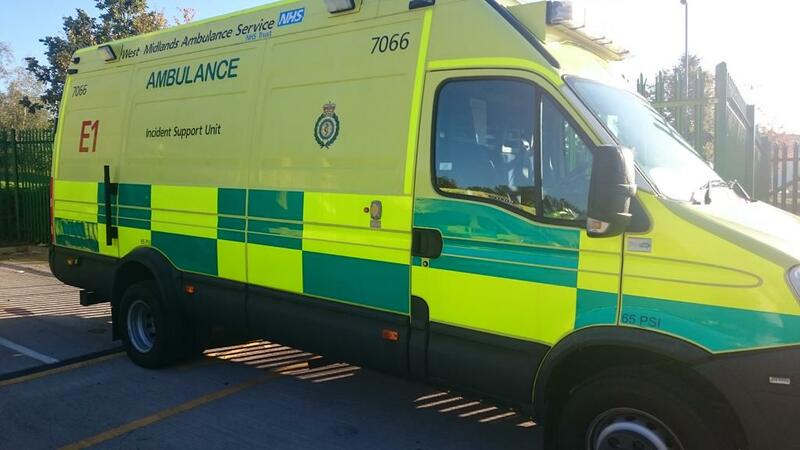 “Whilst the driver, a man, was being assessed and treated in the back of the ambulance his condition quickly deteriorated and he went into cardiac arrest. The ambulance crew and paramedic officer commenced resuscitation efforts and, due to his condition, left the scene for nearby Russells Hall Hospital under blue light conditions. Ambulance staff continued advanced life support en route to A&E. Sadly, despite the best efforts of ambulance staff and hospital medics nothing could be done to save the man and he was confirmed dead a short time later. Tuesday 29th September 2015 – 3.30pm – Claire Brown. 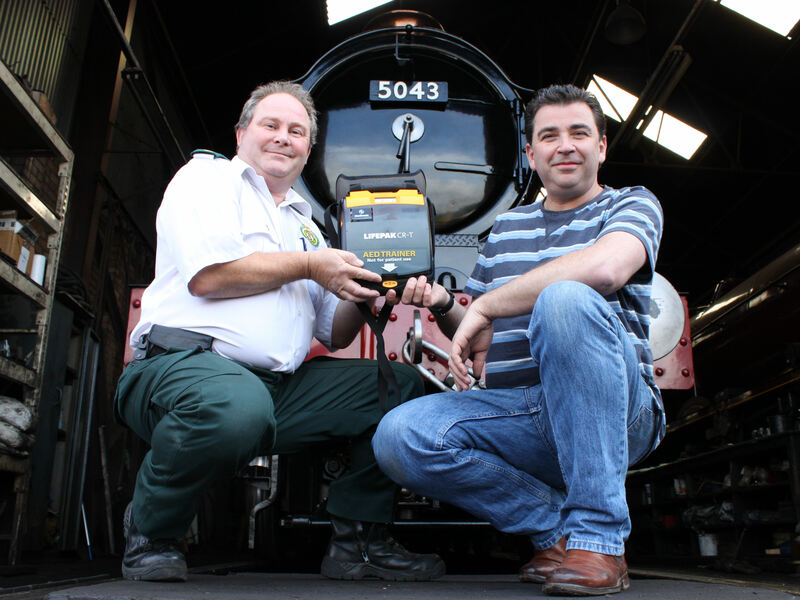 A charity specialising in restoring and cherishing vintage trains is running on shocks as well as steam thanks to West Midlands Ambulance Service. Vintage Trains in Tyseley, Birmingham, is one of Britain’s leading main line steam train excursion companies. As well as excursions, it restores some of the oldest steam trains in the country. Ben Mason from Vintage Trains, said: “With visitor numbers to our workshop hitting 5,000 during one of our open weekends and with up to 400 passengers on each excursion, we were keen to ensure we had equipment on hand to help in an emergency. Pictured (left to right): Andy Jeynes and Ben Mason. Tuesday 29th September 2015 – 1.35pm – John Hawker. A man has been treated at the scene of an RTC in Coventry this morning after the van he was driving rolled over after a crash. 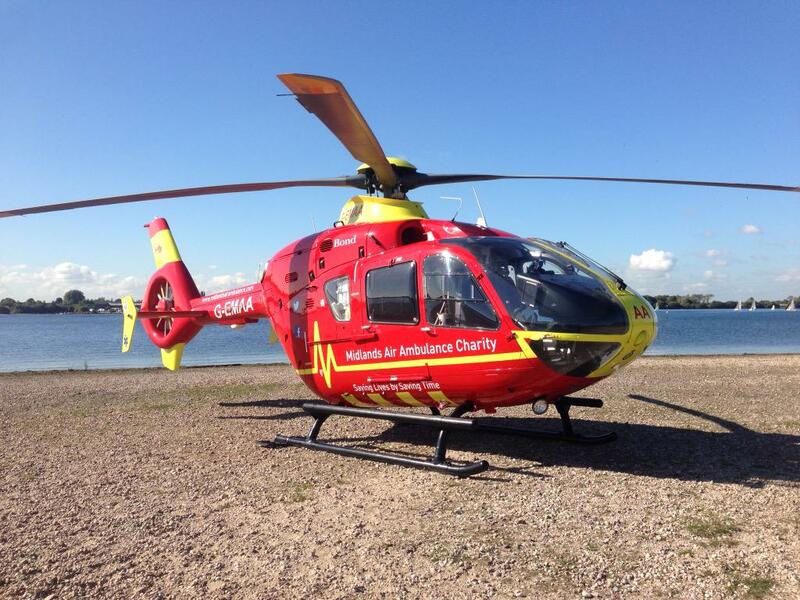 The incident occurred at an island near M6 junction 2 and the A4600, at just before 11am. An ambulance and a paramedic officer attended the scene. A West Midlands Ambulance Service spokesman said: “Crews arrived to find a car and a flatbed van that had been in a collision. The van had subsequently rolled over and the gas bottles it was carrying were thrown all over the road, with some being found around 70 metres away. 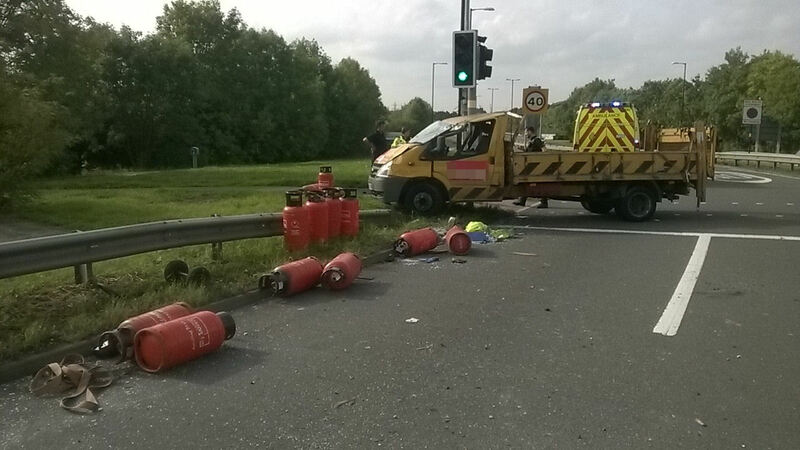 Fortunately the gas bottles were all empty at the time of the crash. “The driver of the van, a man believed to be in his 30’s, was treated at the scene by medics for multiple minor cuts and bruises. Following treatment the man was discharged and didn’t require further treatment. “The woman driving the car, believed to be in her 40’s, was not injured in the crash. Tuesday 29th September 2015 – 1.30pm – Murray MacGregor. It’s an oft used phrase, but in this case, “This award is for the whole team”, exactly sums up the feelings of the two doctors and a critical care paramedic who were given a Pride of Britain Award last night for their work rescuing the four people trapped in the front row of the Smiler Ride at Alton Towers on 2nd June. Army doctor Major David Cooper and aircrew paramedic Tom Waters were on the Midlands Air Ambulance at Cosford when they were called to the theme park following the incident in June. Dr Ben Clark, who is a volunteer with North Staffordshire BASICS emergency doctors was also mobilised to the scene. 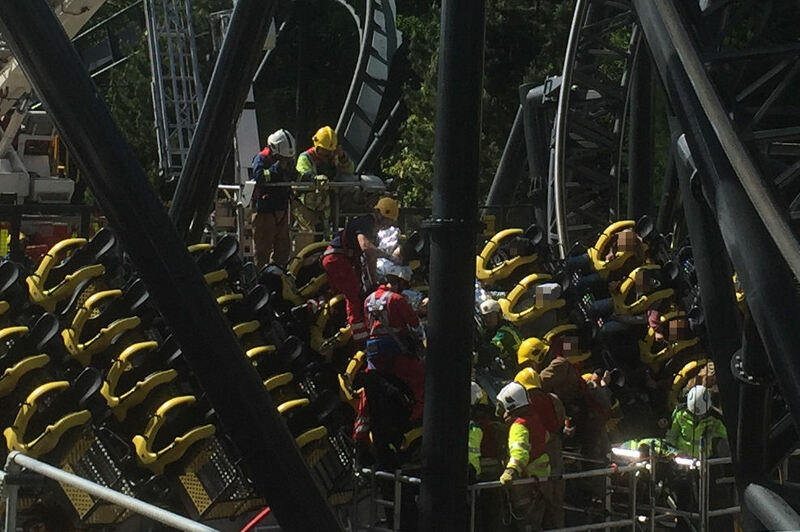 Working with about 50 other ambulance staff, the local Alton Community First Responders, staff at the Alton Towers Park and firefighters, the three climbed onto the Smiler Ride to free the trapped victims. Speaking at the awards last night, West Midlands Ambulance Service Paramedic Tom Waters, said: “We need to remember that it wasn’t just us up there. This was a massive team effort by everyone there. 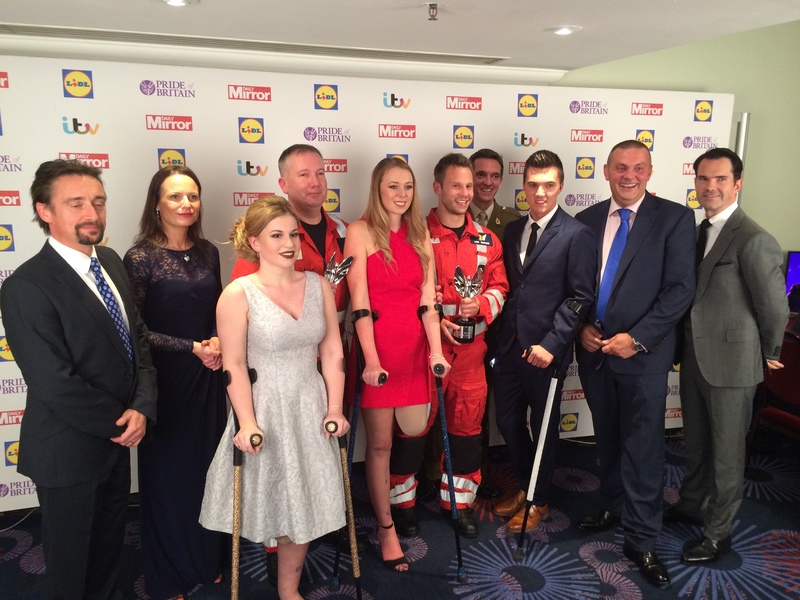 “Receiving the award does mean a lot, but for us, the real heroes are Vicky, Daniel, Joe and Leah who were trapped; they were so brave on the day and still are. Monday 28th September 2015 – 6.40pm – Murray MacGregor. 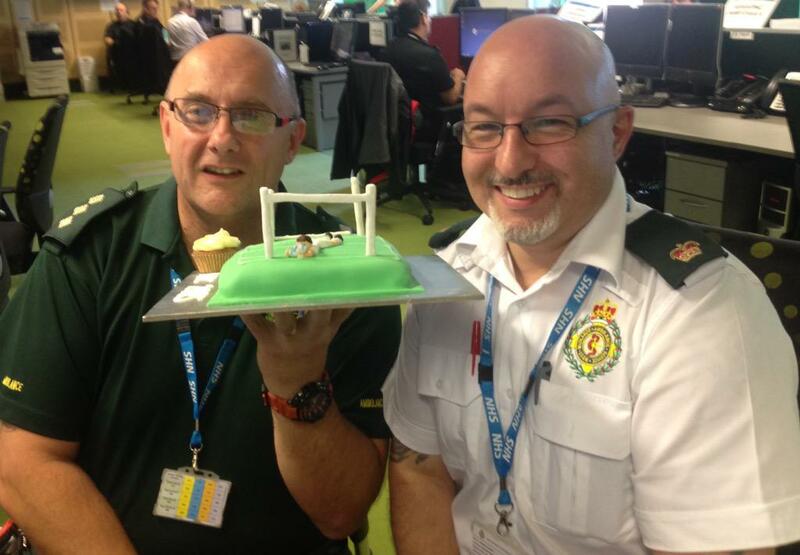 Ambulance bosses are paying tribute to the immense effort put in by staff over the ‘Super Saturday’ weekend. With the Trust only 6 calls shy of 6,000 999 calls over the two days, demand was significantly above what would have been expected for a normal weekend. However, due to good planning and a lot of hard work from staff, many of whom gave up a weekend off to come in to work, the weekend went exceptionally well from a patient perspective. With a bumper programme of international sport, fashion, music, events and shopping on the cards, along with good weather, the whole region was buzzing with activity. Emergency Services Director, Craig Cooke, said: “We started planning for this weeks ago to ensure people continued to get the medical support they needed in an emergency. 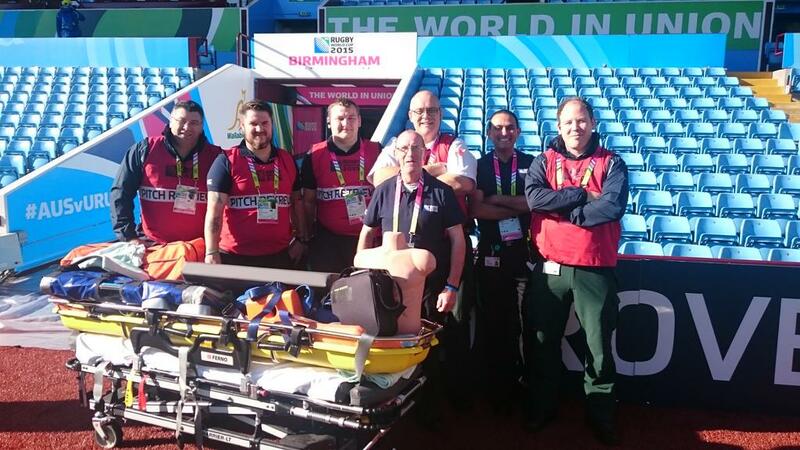 “We put in place joint working with police, the Rugby World Cup medical staff at Villa Park, and the teams of community first responders who assisted over both days. 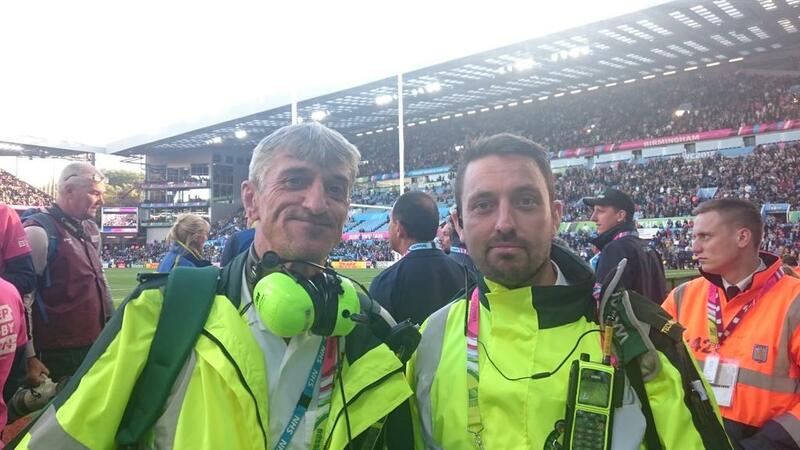 The arrangements we put in place meant we had forward operational commanders in place at all of the major public areas such as the Fan Zone, city centre and Villa Park. 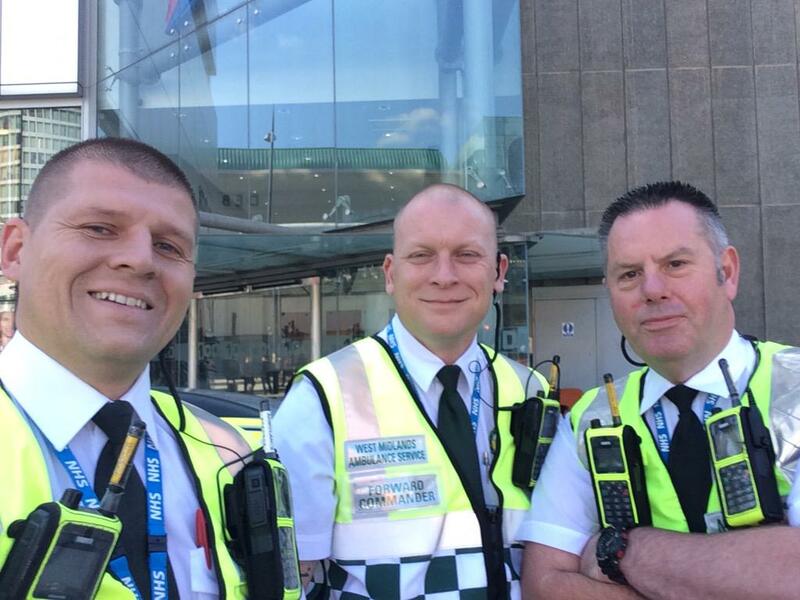 Our City Centre Treatment Unit also operated with additional staffing throughout the weekend in Birmingham’s Broad Street. “I’d like to pay tribute to our staff, who not only provided first rate clinical care to patients, but also got into the spirit of the weekend. “In the main, the public took on our request to take responsibility for their own safety and the majority were good natured and were clearly enjoying the atmosphere. Free CPR and defibrillator training sessions start from Tuesday 29th September. 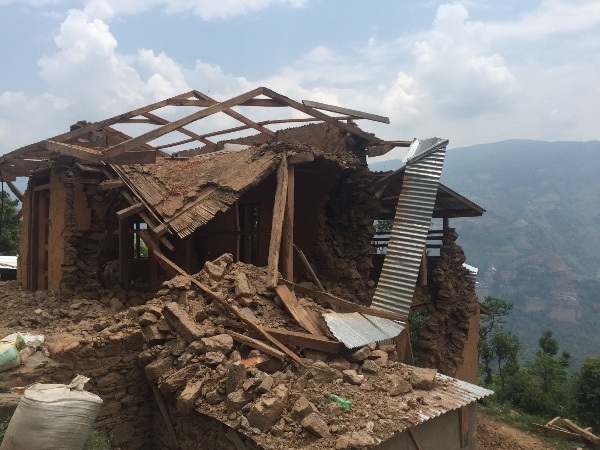 Paramedic Phil Llewellyn will be on BBC One’s Inside Out tonight at 7.30pm talking about the Nepal earthquake. Monday 28th September 2015 – 1.40pm – Chris Kowalik. 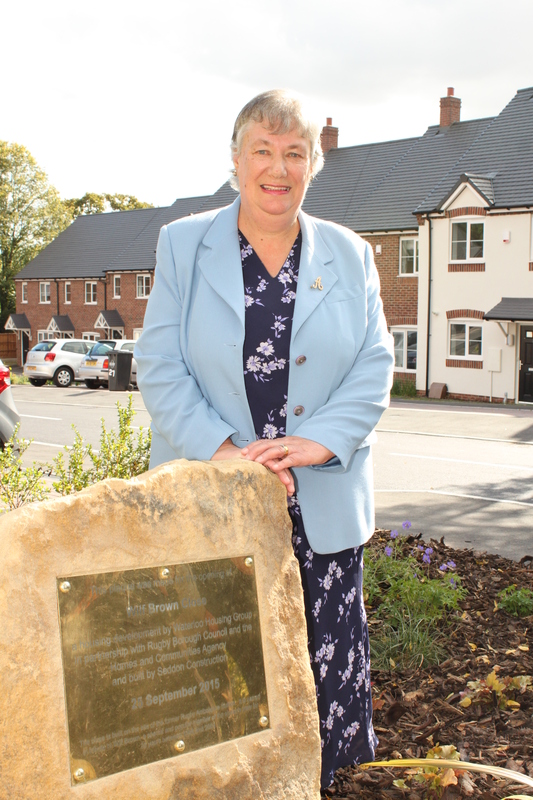 The site of a former ambulance station in Warwickshire has been named after one of its former members of staff. 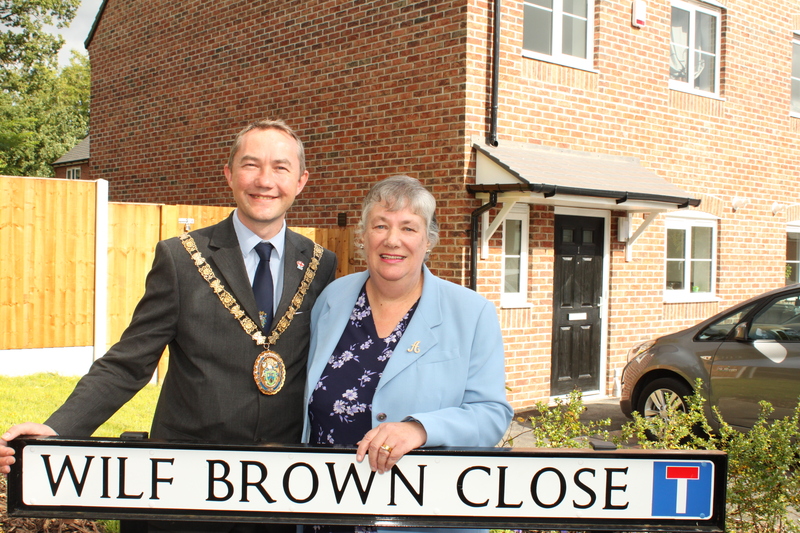 Wilf Brown Close is a cul-de-sac in Rugby where the town’s ambulance station was previously based. 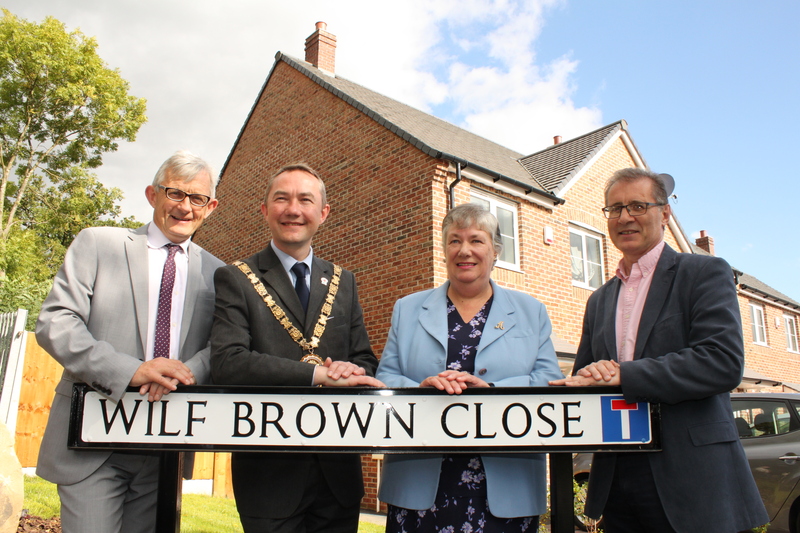 It has been replaced by 29 houses and the street was formally named on Friday 25th September as Wilf Brown Close by his wife Anne, accompanied by family and friends including former colleagues. 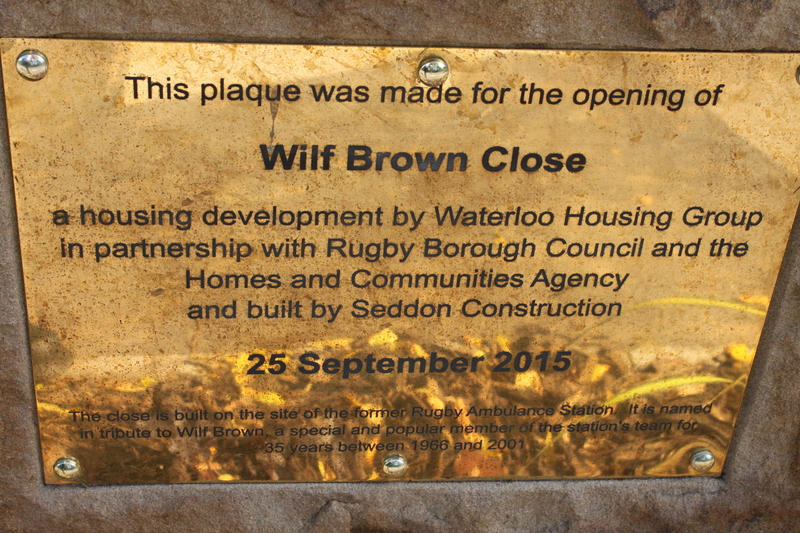 Wilf Brown worked in Rugby throughout his entire ambulance service career between 1966 and 2001. His roles included those of Leading Ambulanceman and Technician. He died in 2004 at the age of 62. Note to Editors: Rugby Ambulance Station was sold as part of West Midlands Ambulance Service’s “Make Ready” plans to introduce ambulance preparation and maintenance hubs and an increased number of smaller Community Ambulance Stations, two of which are now based at other locations in Rugby. Monday 28th September 2015 – 12.45pm – Chris Kowalik. A man has suffered suspected back, head and pelvic injuries after colliding with a car in Warwickshire. 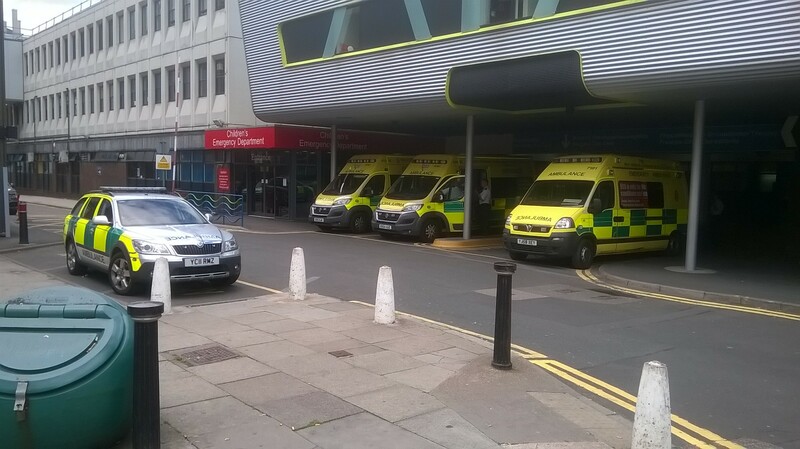 West Midlands Ambulance Service was called to Warwick Road, Stratford at 9.35am today. Two rapid response vehicles, driven by an advanced community paramedic and a paramedic area support officer attended along with an ambulance crew and the Warwickshire and Northamptonshire Air Ambulance. A West Midlands Ambulance Service spokesman said: “The man who is in his fifties, was immobilised and given pain relief. Sunday 27th September 2015 – 9.12pm – Murray MacGregor. His wife went into the canal to try and rescue him but couldn’t get him out. When an ambulance and paramedic area support officer arrived, they too tried to help get him out but it wasn’t until police officers arrived that they were able to do so. Sunday 27th September 2015 – 8.50pm – Murray MacGregor. 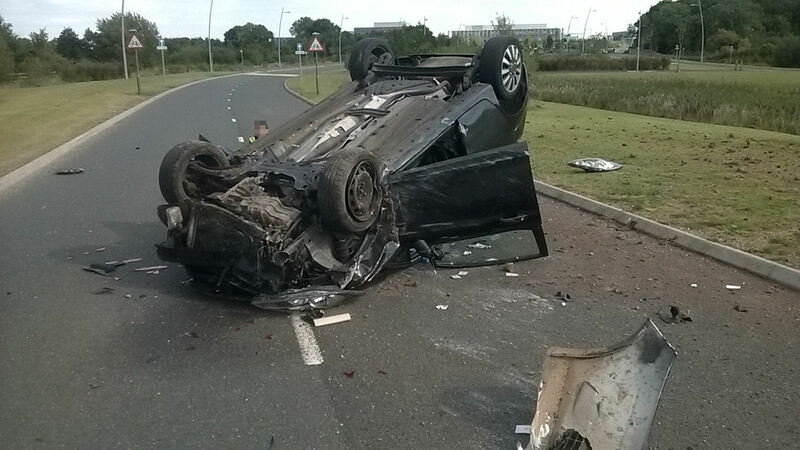 A man and a woman have suffered serious injuries after a three car crash; but three other men escaped injury despite their car ending up upside down. The crash happened on the Uttoxeter to Ashbourne road near to Doveleys Garden Centre at Rocester. No fewer than two Midlands Air Ambulances from Cosford and Staffordshire, a BASICS Emergency doctor, an ambulance, a rapid response vehicle, a community first responder and a paramedic area support officer were sent to the scene after the crash just before 2.30pm on Sunday afternoon. A West Midlands Ambulance Service spokesman said: “On arrival crews found one car on its roof with significant front end damage. A second car had suffered very severe damage, while a third car was also badly damaged at the front. “There were three men in the overturned car. Amazingly, all three were able to get out themselves, and after assessment by the doctor, were discharged at scene. “The man driving the second car, who was about 40, was disorientated and had suffered major bleeding in the abdominal area. 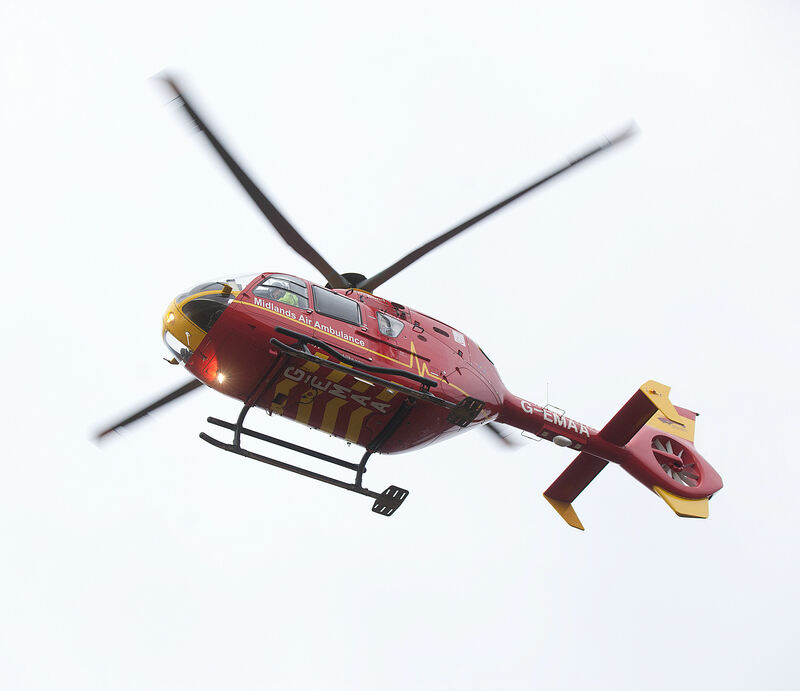 After being assessed and immobilised at the scene, he was very quickly airlifted to the Major Trauma Centre at Royal Stoke University Hospital. Due to the seriousness of his condition, he was almost immediately taken to theatre for surgery. 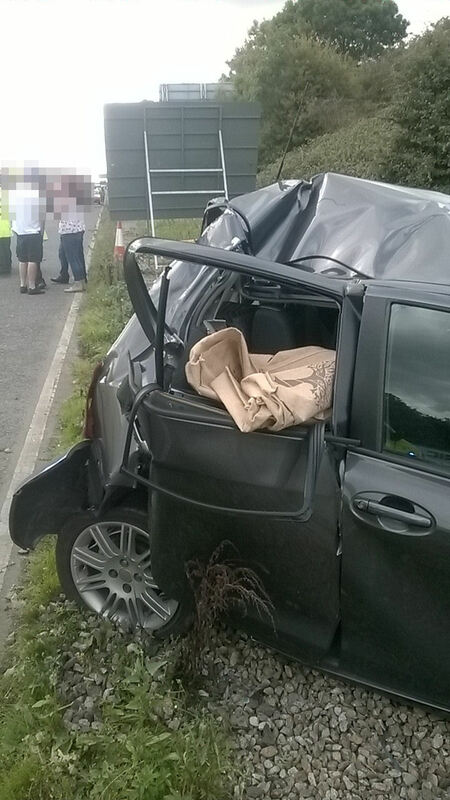 “A 49 year old woman in the third car was trapped for around 40 minutes. Thankfully her injuries were not so serious. She was complaining of left hip pains and has seat belt marks on chest. One of the critical care paramedics from the Staffordshire aircraft travelled with the ambulance crew as she too was taken to Royal Stoke. Sunday 27th September 2015 – 4.07pm – Murray MacGregor. Ambulance, police, fire and Severn Area Rescue Association staff have been out in large numbers after a report of a microlight aircraft going down in flames into wooded area on the Shropshire Worcestershire border. The initial information suggested that it was close to Moffats School at Kinlet Hall at around 11.15am on Sunday morning. West Midlands Ambulance Service sent an ambulance, three paramedic officers, the Hazardous Area Response Team and the Midlands Air Ambulance from Cosford to the area to search. Despite an extensive search along the B4363, nothing was found and the officially ‘stand down’ was given shortly after 3.00pm. Based on the initial information, it was important that a full search of the area was completed. Sunday 27th September 2015 – 8.35am – Murray MacGregor. A man’s suffered critical injuries after a collision with a car on a dual carriageway. The incident happened on The Expressway near to the junction of Trinity Way in West Bromwich at about 5.50am on Sunday morning. An ambulance, a rapid response vehicle and the MERIT Trauma doctor were sent to the scene. A West Midlands Ambulance Service spokesman said: “On arrival, crews found a Jaguar that had damage to its windscreen. “The pedestrian had suffered multiple fractures to his legs and pelvis and had a potential head injury. He was unconscious. “After having his injuries splinted and condition stabilised, he was taken on blue lights to the major trauma centre at the Queen Elizabeth Hospital, Birmingham with the doctor travelling on the ambulance. Sunday 27th September 2015 – 8.25am – Murray MacGregor. A late night crash has left one man with multiple injuries and saw a car pushed through a brick wall. The crash happened in Monmouth Drive in the New Oscott area of Sutton Coldfield at 11.10pm on Saturday night. Two ambulances, a rapid response vehicle, a paramedic area support officer and the MERIT Trauma doctor were sent to the scene. A West Midlands Ambulance Service spokesman said: “The initial collision left one car with a badly damaged side and front end damage. The driver was trapped inside and firefighters worked with ambulance staff to get the man out. “The driver, who was estimated to be in his 50s, had multiple fractures to his legs and pelvis, abdominal injuries and a potential head injury. “His condition was stabilised before he was taken on blue lights to the major trauma centre at the Queen Elizabeth Hospital, Birmingham with the doctor travelling on the ambulance. 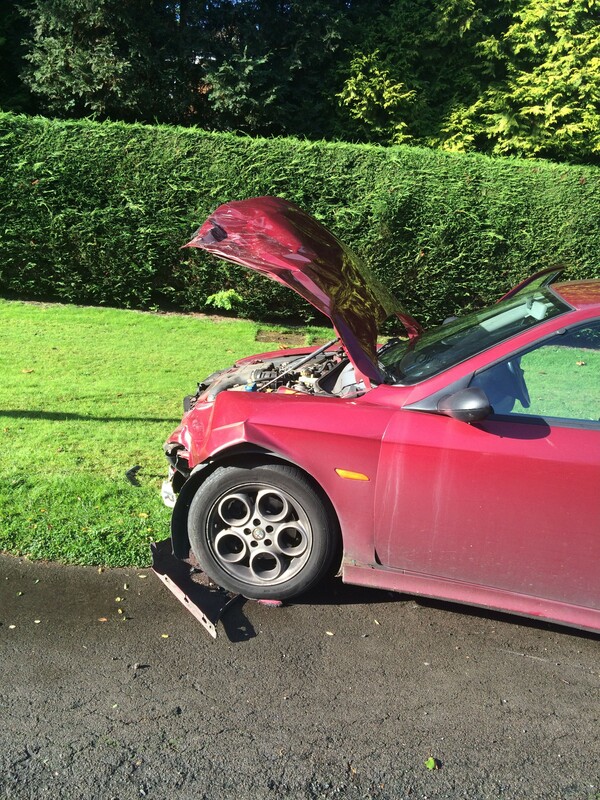 “The second car had front end damage and ended up going through a brick wall into a garden. The driver, a 34 year old man had superficial arm and nose injuries and was complaining of neck pain. Sunday 27th September 2015 – 8.14am – Murray MacGregor. A pedestrian had died after a collision with a vehicle on a country lane. The man was found in Blythe Road, Coleshill at about 4.30am on Sunday morning. There were no vehicles at the location. A West Midlands Ambulance Service spokesman said: “When he was found, the man was in cardiac arrest and had suffered multiple injuries. Sunday 27th September 2015 – 8.08am – Murray MacGregor. 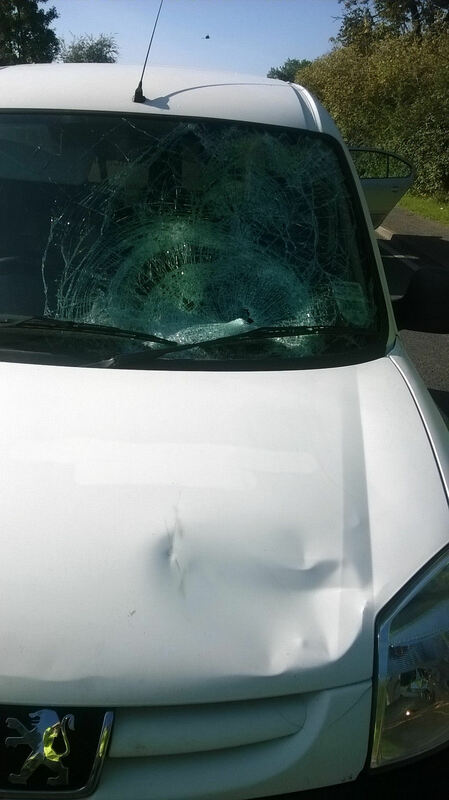 A motorcyclist has suffered multiple injuries after a crash with a car that saw him hit the windscreen. The crash in Widdecombe Close in Coventry happened shortly before 9.00pm on Saturday evening. 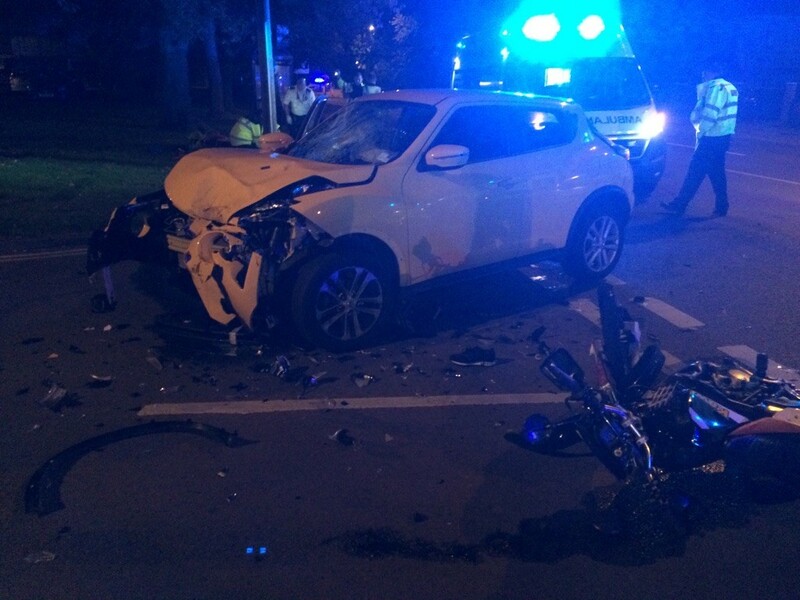 A West Midlands Ambulance Service spokesman said: “When ambulance staff arrived they found a Nissan Juke with a badly damaged windscreen where the rider had collided with it. “Ambulance staff treated him at the scene to stabilise his condition. He had splints applied to his leg and arms and had a pelvic binder put in place; he was also immobilised in case of any back injury. “He was then taken on blue lights to the major trauma centre at University Hospital Coventry & Warwickshire. Two ambulances, a rapid response vehicle and a paramedic area support officer were sent to the scene. Saturday 26th September 2015 – 7.00pm – Murray MacGregor. 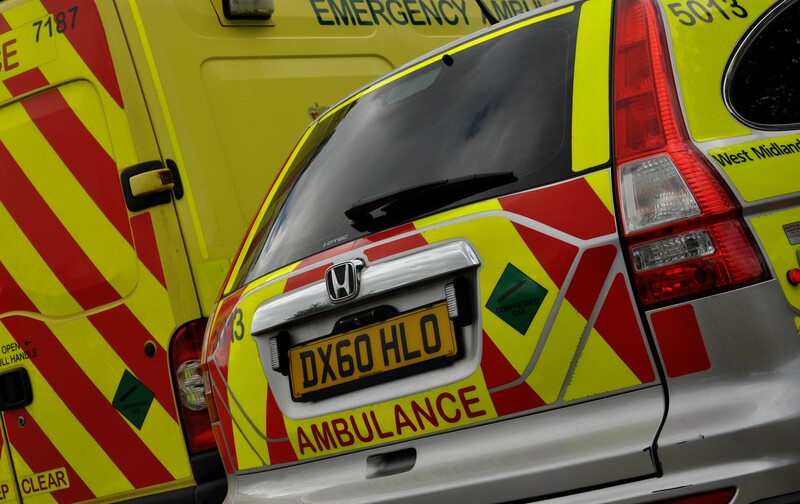 A motorcyclist has suffered a badly broken leg after being found almost 10 metres from where his bike was in collision with a car. The bike had suffered significant damage as had the car, which had front end and passenger side damage. Two ambulances, a paramedic area support officer and the Midlands Air Ambulance from Staffordshire were sent to the scene. A West Midlands Ambulance Service spokesman said: “When the original ambulance crew arrived they found a man who had a badly broken right leg. “Fortunately, the 33 year old had been wearing full leathers and a crash helmet which had reduced other injuries given how far he ended up from his bike. “The ambulance crew immobilised the rider and applied a splint to his leg. He was then taken by land ambulance to Walsall Manor Hospital. Saturday 26th September 2015 – 1.36pm – Murray MacGregor. 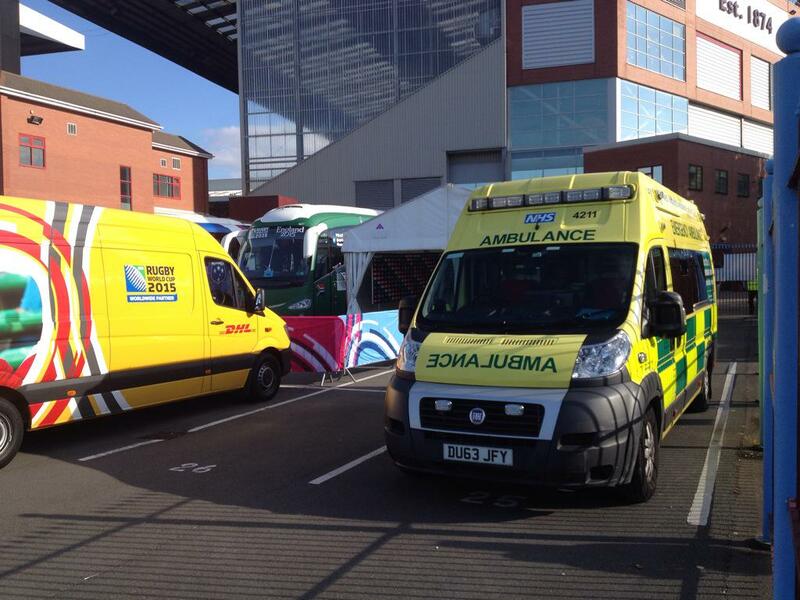 West Midlands Ambulance Service is gearing up for potentially one of the busiest weekends of the year. With a bumper programme of international sport, fashion, music, events and shopping on the cards, along with good weather, the whole region looks set to be buzzing with activity. As a result, the Trust has put in place extensive plans to ensure people continue to get the medical support they need in an emergency. Emergency Services Director, Craig Cooke, said: “We have been planning for this weekend for quite a while now. We are expecting literally hundreds of thousands of people to be out enjoying the wonderful West Midlands over the two days. “Much of the focus will be on Birmingham with two Rugby World Cup matches to be played, but there are ‘fanzones’ in both Birmingham and Rugby as well. There are also fashion and comedy events taking place and of course, the new multi-million pound shopping centre above the revamped New Street Station in Birmingham. “As usual, our City Centre Treatment Unit will be operating tonight in Birmingham’s Broad Street and we’ll have additional staff working with that. “Add to that, football matches in Stoke, Shrewsbury, Walsall and Birmingham and a league rugby match in Worcester and you can see it is a bumper weekend. “As a Trust we will have additional ambulances, rapid response vehicles, doctors and volunteer community first responders on duty right across the Region keeping the public safe. “However, we would ask the public to take responsibility for their own safety; if you’re out in a group, make sure you look out for each other. Have you thought about how you are going to get home? Friday 25th September 2015 – 8.45pm – Murray MacGregor. 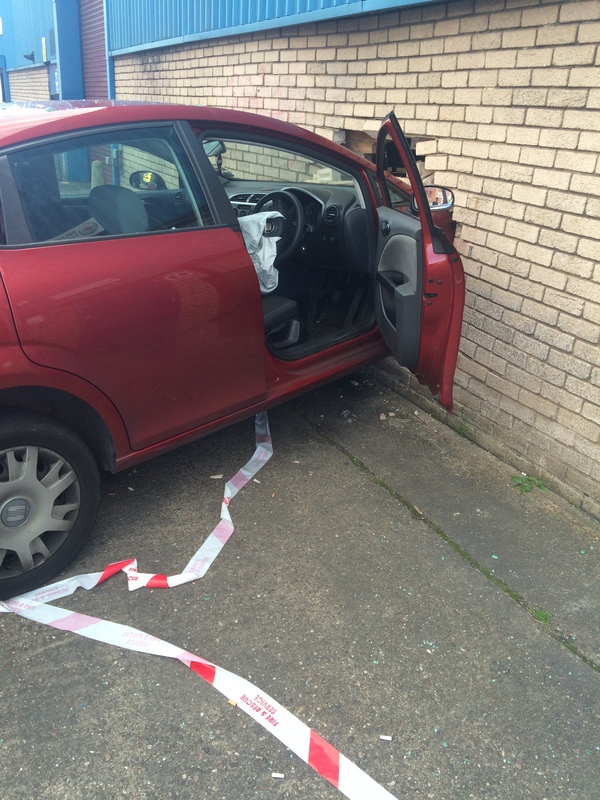 Two men had the surprise of their life when a car came through the wall of the industrial unit they were working in knocking them to the floor. 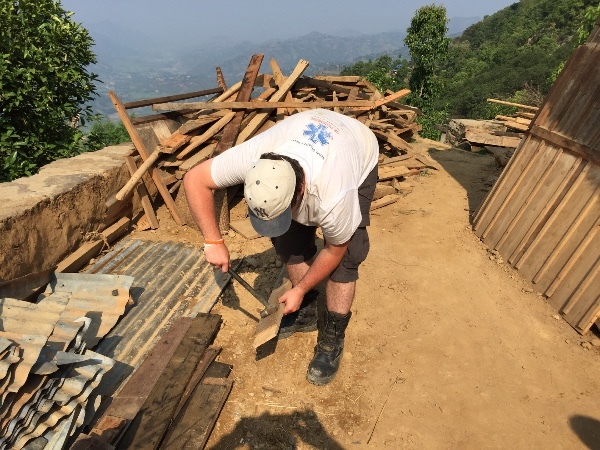 Incredibly though, despite being left on the floor in a cloud of dust and fallen masonry, they only had a few cuts, bumps and bruises and neither required hospital treatment. The incident happened in Stratford Street North in the Sparkbrook area of Birmingham at about 3.50pm on Friday afternoon. A West Midlands Ambulance Service spokesman said: “When we were called, we were told that a car had gone into a building, but when the ambulance, rapid response vehicle and paramedic area support officer arrived they found that the red Seat had also collided with the driver’s side of a grey Audi A3. 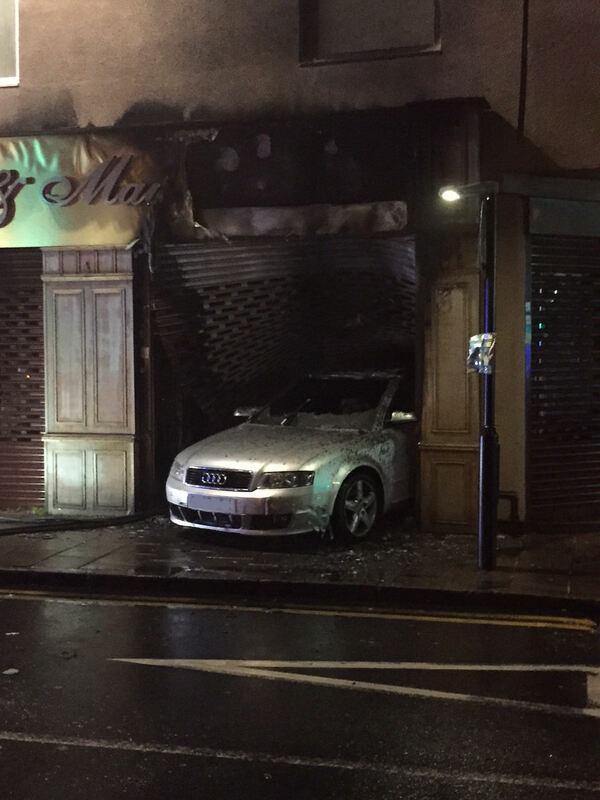 “The front of the car had gone through the wall of the building but had only got about 8 inches through the other side. Despite that, it had caused the raised table area on the other side to be shoved forward knocking the two men beside it to the floor. “The men were thrown to the ground. Although not trapped, they were covered in dust and debris. The first, who was 28, had some leg pain, while the other, who was 61, had pain down the right side of his body. After being assessed at the scene, they were discharged. “The driver of the Seat car had minor pain to his nose and leg but refused hospital treatment and was left with police. 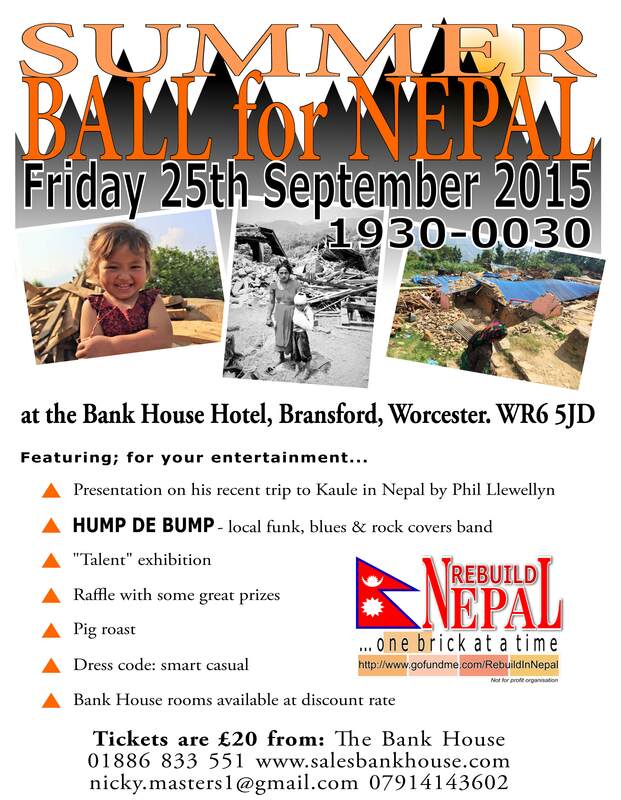 Friday 25th September 2015 – 4.30pm – Steve Parry. 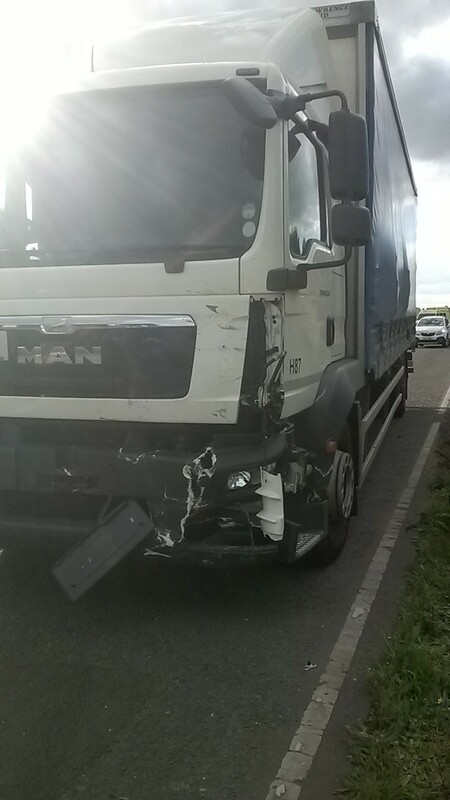 A female motorist has been taken to hospital after her car was badly damaged in a collision with a lorry just off the M6 junction 1 in Warwickshire this afternoon. A West Midlands Ambulance Service spokesman said: “Crews treated a woman in her thirties after her car was in collision with a lorry. Friday 25th September 2015 – 6.55am – Murray MacGregor. Six men have the strength of modern car designs to thank for escaping with only minor injuries after a crash that left debris strewn across a major road junction. 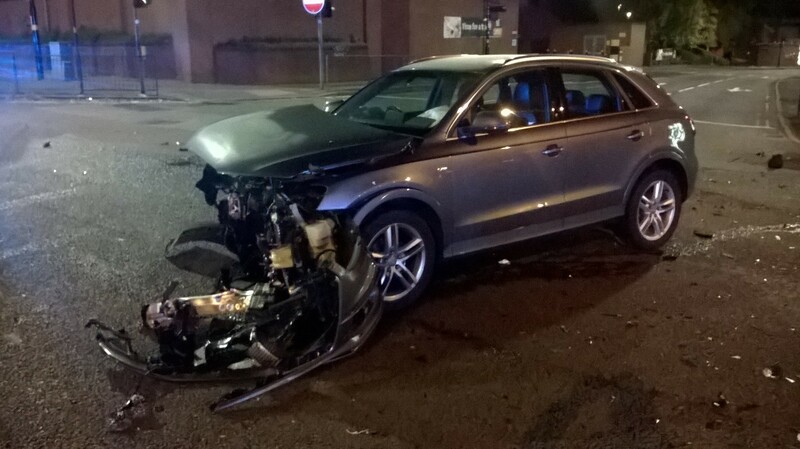 There was a collision at the junction of Bristol Road and Elliot Road in the Selly Oak area of Birmingham at about 2.40am on Friday morning involving two cars that left one car against a set of traffic lights and the other without most of its bonnet. A rapid response vehicle came across the crash shortly after it happened. It was backed up by a further response vehicle, three ambulances and a paramedic area support officer. A West Midlands Ambulance Service spokesman said: “The initial call suggested that it was going to be a much more serious incident than it actually turned out to be. “Three men were taken to City Hospital from the white car – one had chest pain, a second head pain anf the third, who was immobilised using a neck collar and spinal board, had a leg injury. Two other men from the car were uninjured. “There was a single man in the dark coloured car. He was also immobilised, complaining of back pain. All six had managed to get out of their vehicles unaided. Thursday 24th September 2015 – 5.10pm – Chris Kowalik. 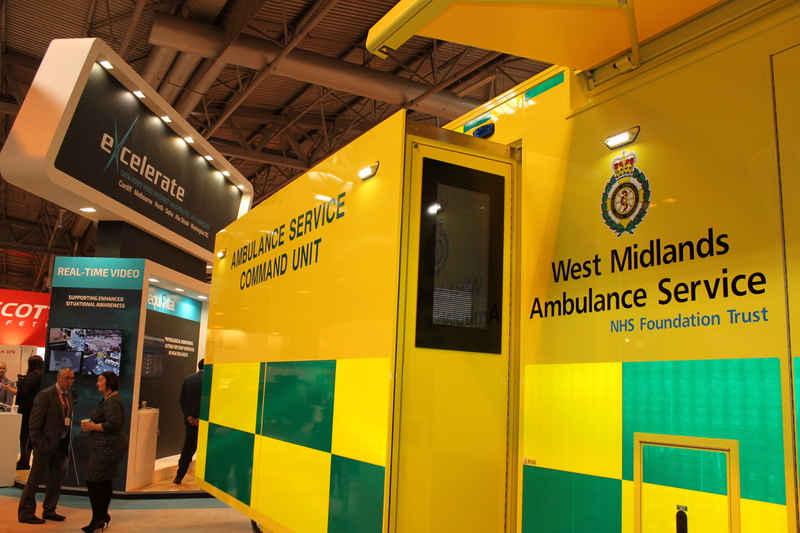 West Midlands Ambulance Service has a brand new specially-built vehicle with the latest, state-of-the-art technology to deal with large, serious and major incidents. 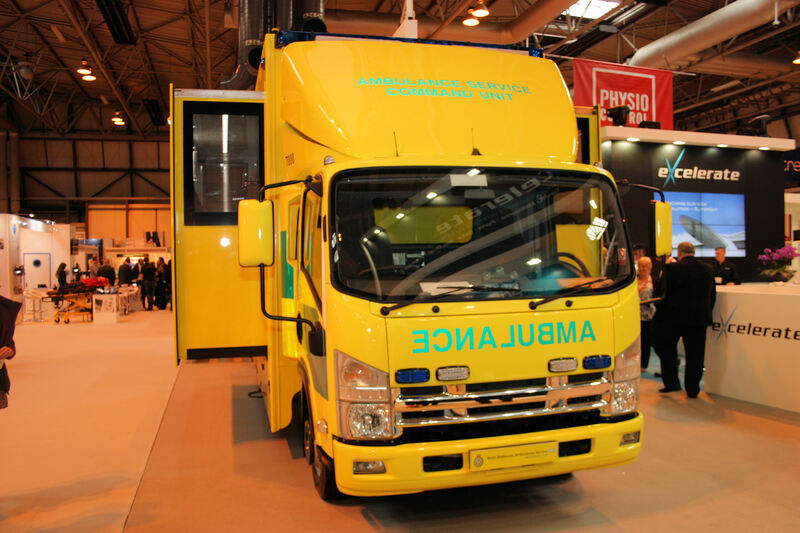 Unveiled yesterday at the Emergency Services Show at the National Exhibition Centre and costing £440,000, the Ambulance Service Command Unit was likened to a ‘mobile mini headquarters’ that would be sent to cases such as a plane, railway or multi-vehicle motorway crash, or something more prolonged such as flooding anywhere in the region. It would be a base for the ambulance service’s commanders at the scene for the duration of the incident. The vehicle is based on a 7.5 tonne Isuzu chassis with custom slide-out pods, its own briefing room with seating for up to nine people, conference table, briefing screens, laptop positions and video and phone conferencing. It is capable of accommodating not only ambulance service commanders but also those of other emergency services to help them collectively manage the incident better. 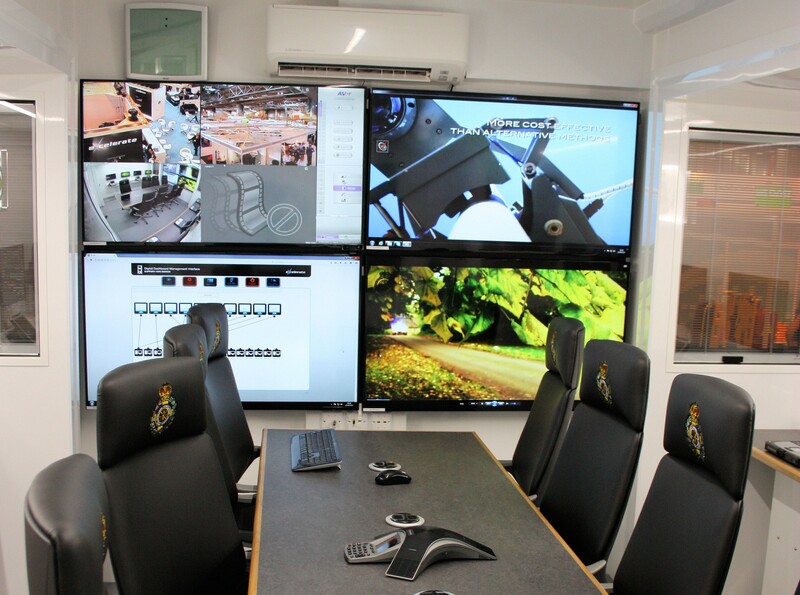 Screens inside the vehicle would show live pictures from CCTV cameras, a camera perched on an extendable pole and body cameras worn by Hazardous Area Response Team paramedics from within the incident ‘hot-zone’ where only those with protective clothing and equipment can enter. On the outside of the vehicle, there is a large screen for briefings to be held. There is also a live satellite link to the ambulance service’s main headquarters and weather monitoring information such as precipitation, wind speed and direction which is important for a chemical incident. It will be from the Command Unit at the scene using data from its raft of equipment that real-time decisions about the handling of the situation would be made. 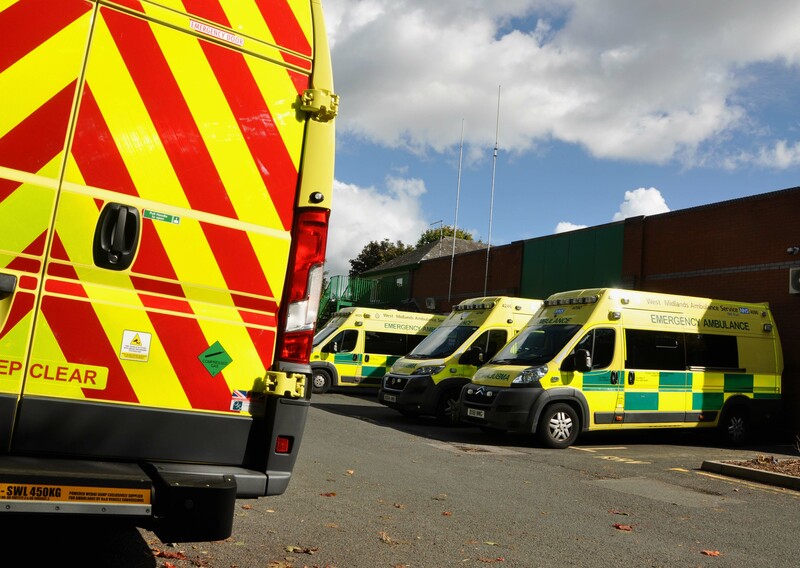 It also means the incident can be managed separately from the day-to-day 999 cases that would be left with the ambulance service’s control rooms in Brierley Hill and Stafford to continue to deal with as normal. Thursday 24th September 2015 – 4.45pm – Chris Kowalik. A woman in her twenties suffered a broken thighbone and a suspected pelvic injury after a crash on the A38. 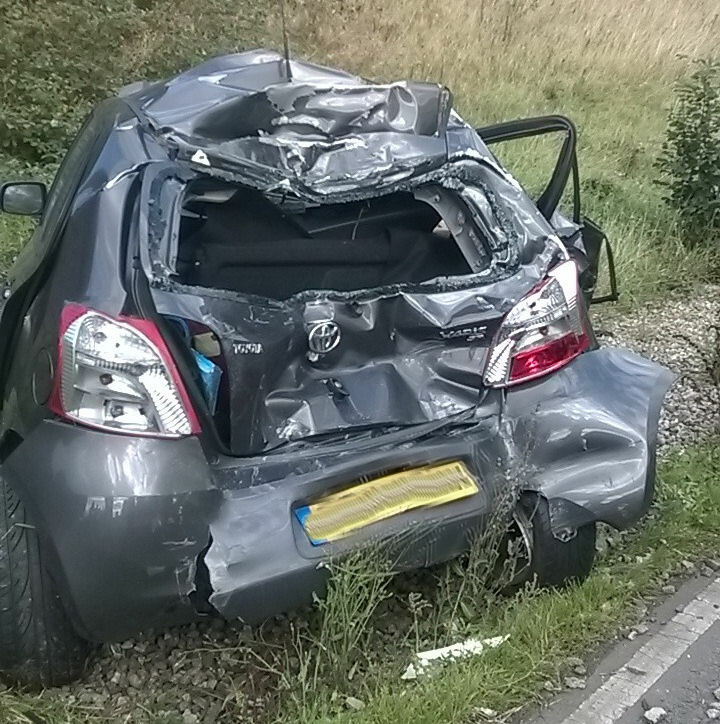 Her car collided with a tree near the Lydiate Ash roundabout. West Midlands Ambulance Service was called shortly before 2.35pm. 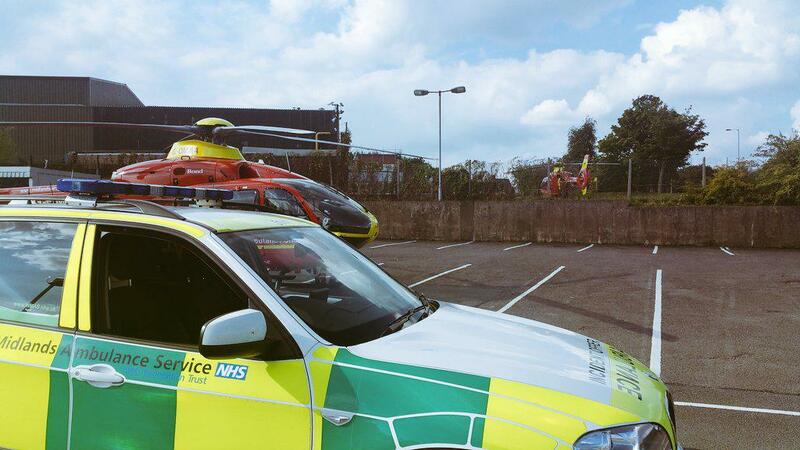 Two rapid response vehicles driven by a paramedic area support officer and a paramedic attended along with an ambulance crew and the Midlands Air Ambulance from Strensham. Thursday 24th September 2015 – 11.15am – Chris Kowalik. 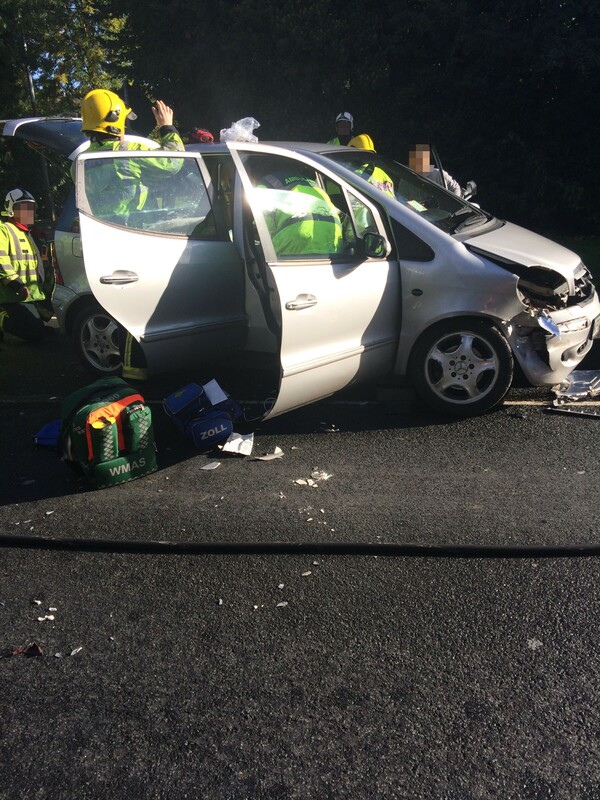 A woman had to be cut free and immobilised after the car she was driving collided with another. West Midlands Ambulance Service was called to the junction of Warwick Road and Jacobean Lane in Knowle, Solihull shortly before 8.55am today. Warwick Road was blocked by the collision. Two rapid response vehicles, driven by an advanced community paramedic and a paramedic area support officer attended along with an ambulance crew. A West Midlands Ambulance Service spokesman said: “Both cars were damaged but only one of the drivers needed treatment. She had neck and back pain and was therefore cut free from her car with the help of the fire service. Ambulance crews immobilised her with the use of a spinal board and neck collar and took her to University Hospital Coventry and Warwickshire. It was all as a precaution. Thursday 24th September 2015 – 9.15am – Chris Kowalik. For the second consecutive morning, West Midlands Ambulance Service has been called to a rush-hour crash that led to delays on the M6. Today, it was on the southbound carriageway between junctions 4 and 3 resulting in the closure of two lanes. We were called at 7.30am and sent a paramedic area support officer in a rapid response vehicle and an ambulance crew. A passing senior paramedic officer also stopped to help. A West Midlands Ambulance Service spokesman said: “It involved a lorry, a small van and a car. “A man in his thirtes who was driving the lorry and a woman in her forties who was driving the car were uninjured and were both discharged at the scene by ambulance crews following assessments. Wednesday 23rd September 2015 – 2.40pm – Claire Brown. A man who went into cardiac arrest after his car overturned was resuscitated by ambulance staff at the scene before being rushed to hospital for emergency treatment. The incident happened in Venture Way, Brierley Hill, shortly after 12.30pm this afternoon (Wednesday). Two ambulances, a community paramedic and a paramedic area support officer were sent to the scene. A paramedic training officer from the Trust came across the incident and stopped to help at the scene. A West Midlands Ambulance Service spokeswoman said: “When the first ambulance crew arrived the car was on its side, propped up by metal railings at the side of the road. The driver, a man, was quickly assessed and was found to be suffering a heart attack. “Sadly his condition deteriorated and he went into cardiac arrest. The team of ambulance staff commenced advanced life support at the scene and administered five shocks to his heart using a defibrillator. “After a while the team managed to restart his heart and he was alerted to New Cross Hospital by land ambulance. The training officer travelled with the ambulance crew to hospital to continue treatment en route. The man’s condition was said to be critical. Wednesday 23rd September 2015 – 2.00pm – Claire Brown. 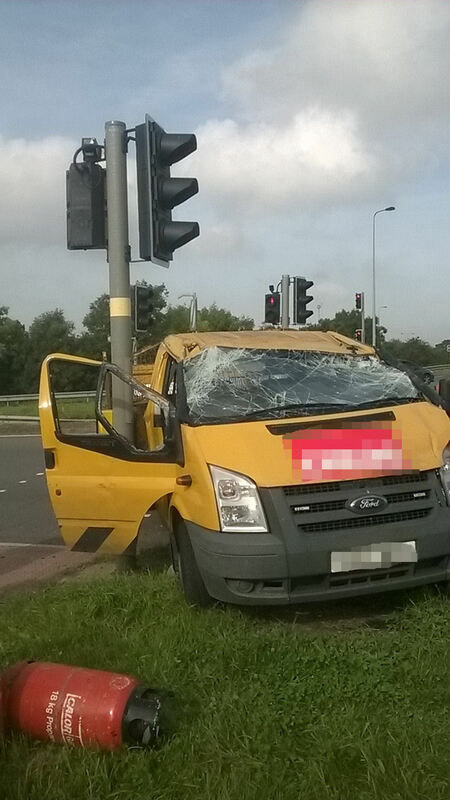 An elderly man has suffered a head injury after being involved in a collision with a car in Nuneaton earlier today. West Midlands Ambulance Service received a 999 call to reports of a collision between a pedestrian and a car near to the library in Church Street, Nuneaton at 11.45am (Wednesday). An ambulance, a community paramedic and a paramedic area support officer attended the scene. A West Midlands Ambulance Service spokeswoman said: “When crews arrived they found an elderly gentleman who had reportedly been in collision with a car. He was sitting up and was conscious and breathing but, when ambulance staff assessed him, they found he had a head injury and were quite concerned with his agitated condition. 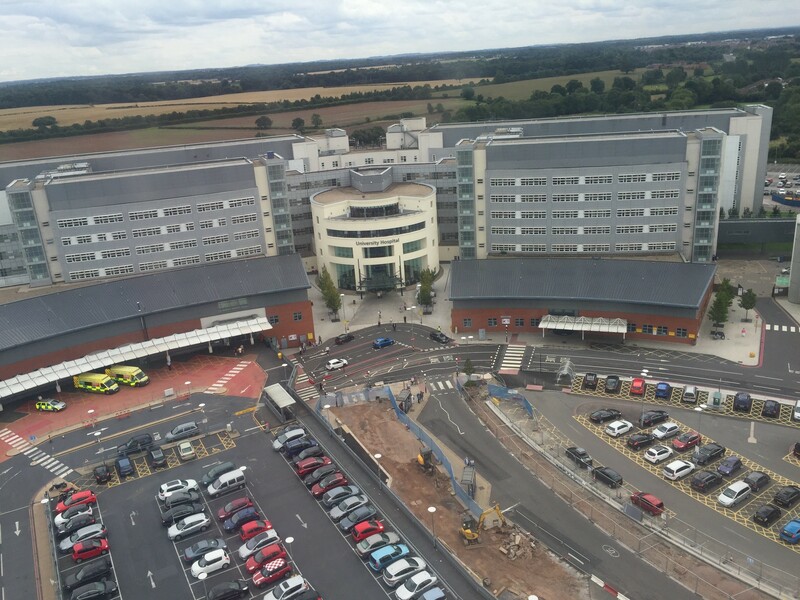 Pictured: Aerial photograph of University Hospital Coventry and Warwickshire courtesy of WMAS. Wednesday 23rd September 2015 – 9.15am – Claire Brown. 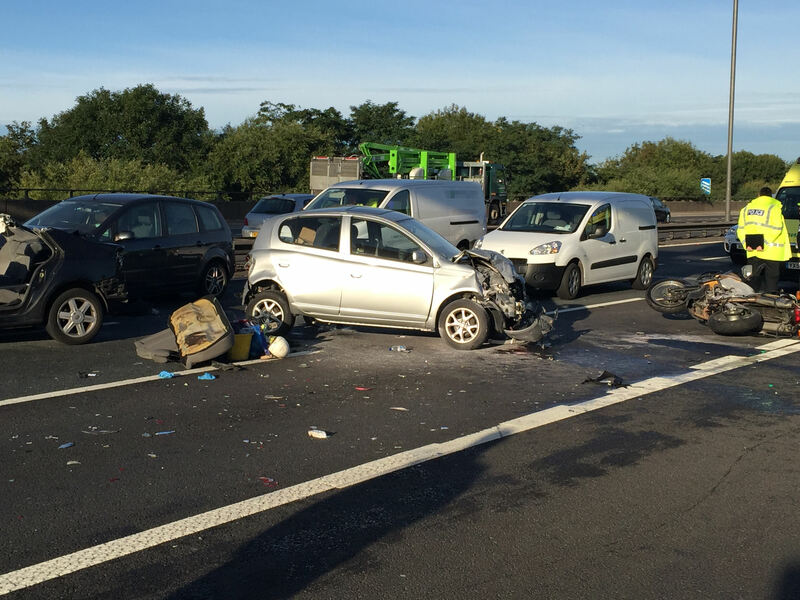 The M6 motorway was closed in both directions in Birmingham earlier following a multiple vehicle collision which left a motorcyclist trapped underneath a car. One of the Trust’s emergency preparedness managers came across the collision on the southbound carriageway of the M6 between junctions 6 and 5 as he was driving to work. He stopped to help and was joined by three ambulances and the Midlands Air Ambulance from Cosford which had a MERIT trauma doctor and Critical Care Paramedic on board. A West Midlands Ambulance Service spokeswoman said: “The motorcyclist, a man in his 30s, had come off his bike and had ended up underneath a car. Police quickly closed the motorway in both directions so that the air ambulance could land on the carriageway. “The motorcyclist was carefully assessed by crews and was found to have sustained serious lower leg injuries and a suspected fractured pelvis. The ambulance staff administered pain relief, fluids and a drug to treat bleeding problems before working carefully with the fire service to lift up the car to release the man. The man was immobilised with a neck collar, spinal board and pelvic splint before being airlifted to Queen Elizabeth Hospital Birmingham for further trauma care. “Three other people from vehicles involved in the collision were also assessed by ambulance staff at the scene. Two were suffering with neck pain and both were fully immobilised with a neck collar and spinal board before being taken to Heartlands Hospital. The third patient suffered less serious injuries and did not require hospital treatment. Notes to Editor: Please credit West Midlands Ambulance Service if you use the photograph. Wednesday 23rd September 2015 – 7.00am – Steve Parry. 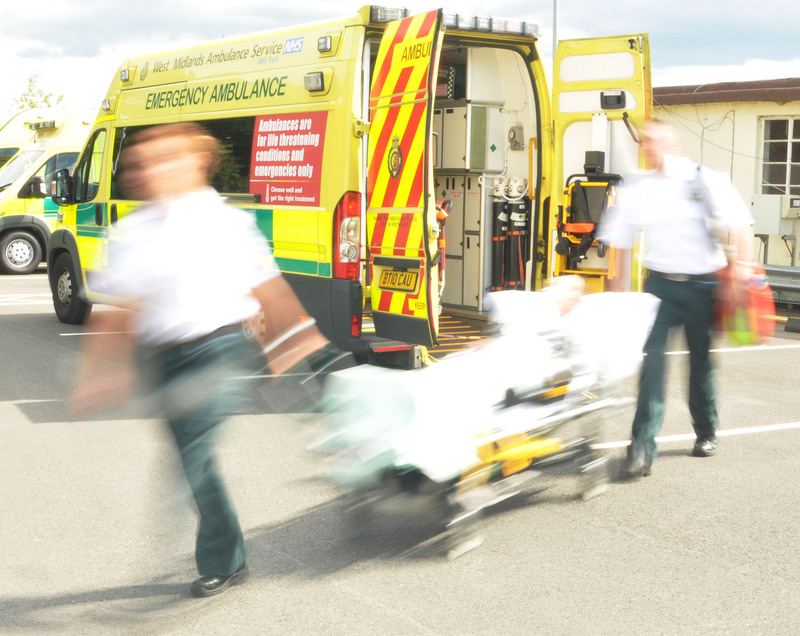 West Midlands Ambulance Service (WMAS) has been shortlisted in not one but two categorises at this year’s prestigious Health Service Journal HSJ Awards. 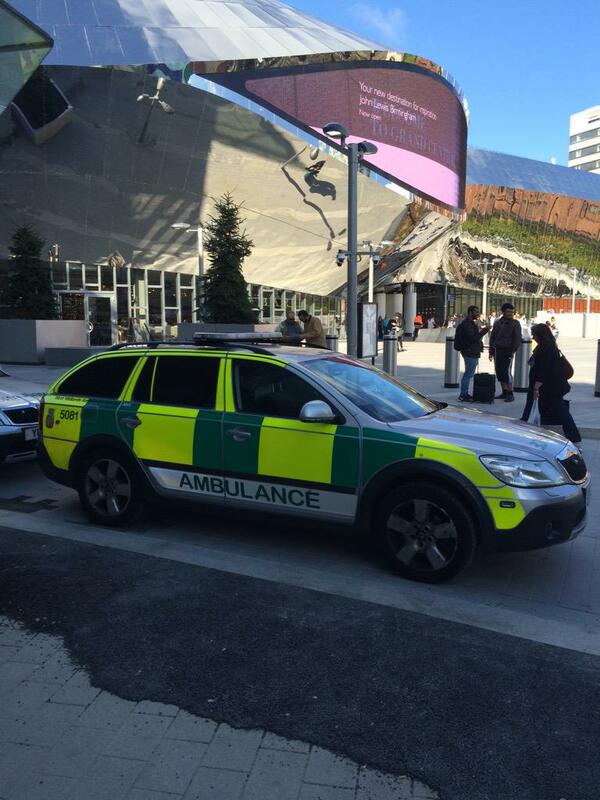 The shortlist has been announced and WMAS is the leading ambulance service participating in the award ceremony which will take place in London next month. 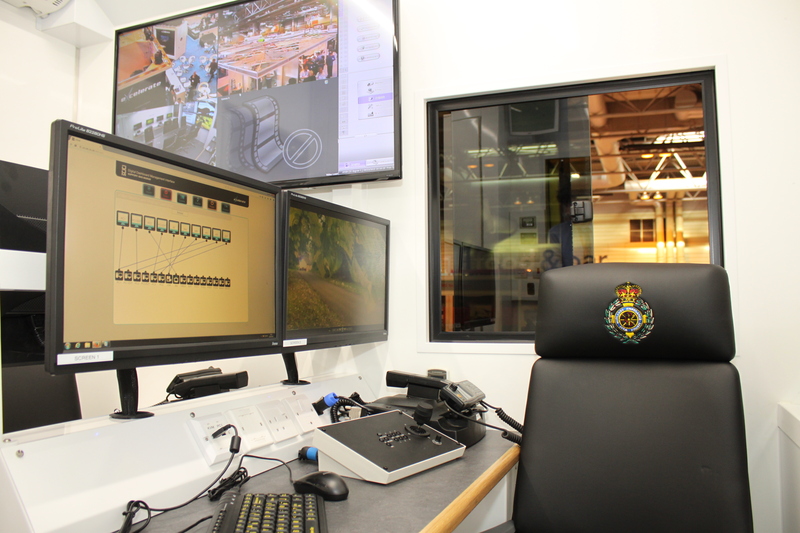 For their combined work on the acclaimed mental health response unit in Birmingham, WMAS together with partners West Midlands Police and Birmingham and Solihull Mental Health Foundation Trust have been shortlisted in the ‘Enhancing Care by Sharing Data and Information’ category. The Trust’s Organisational Development team together with Coventry University will also be at the award ceremony hoping to be successful in the category of ‘Improving Outcomes through Learning and Development’. The programme, which was started in the Trust is now being rolled out across all NHS organisations in the Region in a programme with Health Education West Midlands. WMAS will face stern completion with ten other organisations shortlisted, including another ambulance trust and air ambulance provider. For more information about the HSJ Awards, click here. Tuesday 22nd September 2015 – 7.45pm – Murray MacGregor. 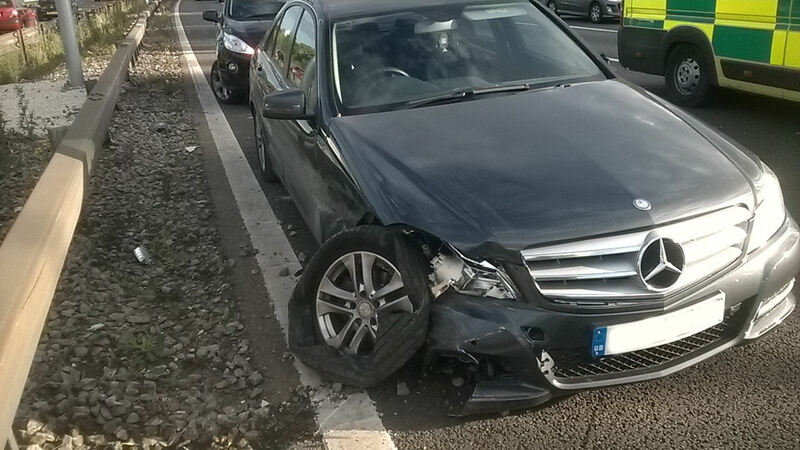 A suspected medical episode at the wheel has left three cars damaged on the northbound M6 and about 100 drivers breaking the law. The incident between junctions 4A and 5 happened at around 4.20pm. The first medic on scene was an off-duty paramedic doing a shadow shift with officers from the Central Motorway Police Group. He was backed up by a senior paramedic officer and two ambulance crews. A West Midlands Ambulance Service spokesman said: “The initial 999 calls suggested the driver might be having a cardiac arrest, but thankfully this turned out not to be the case. “On arrival, the 56 year old driver of a Mercedes was coming round after falling unconscious. 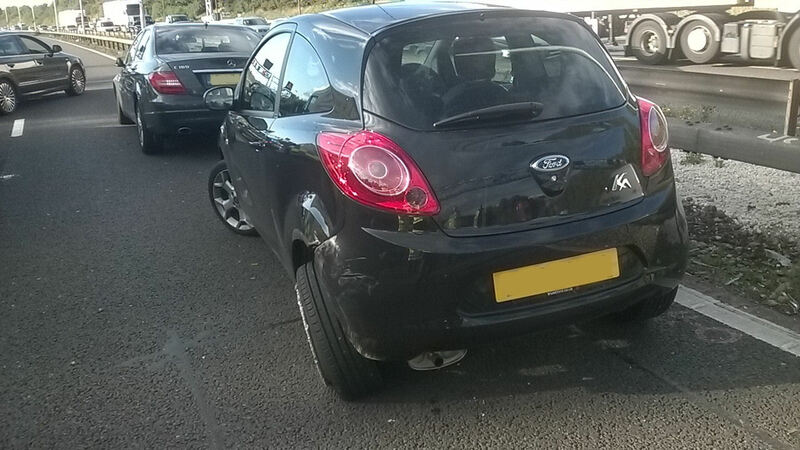 There were two other damaged cars at the scene, a Vauxhall Vectra and a Ford Ka. “As well as the medical incident, the driver of the Mercedes had bitten his tongue badly and had a head injury. He was immobilised using a neck collar and spinal board before being taken to Heartlands Hospital. 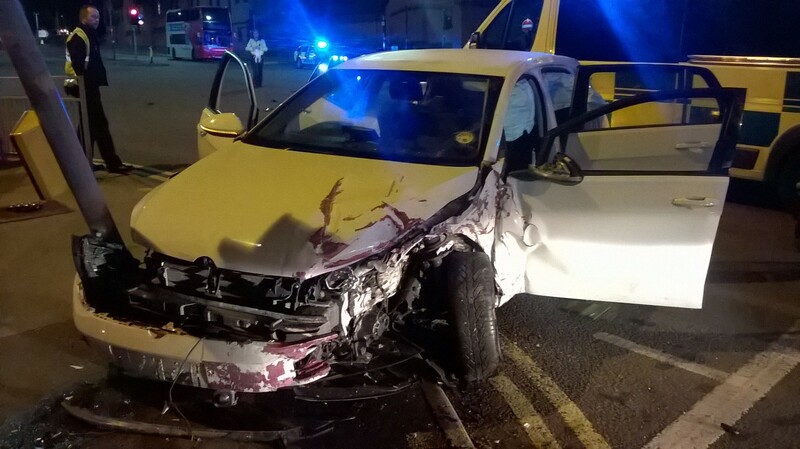 “The 38 year old driver of the Ka, who comes from Selly Oak, was complaining of a headache and neck and back pain. He too was immobilised before being taken to the same hospital. “The driver of the Vectra was uninjured. As the officer was clearing at 5.40pm, the ambulance service received news of another crash on the southbound carriageway between junction 5 and 4a. He made his way to the scene through the backed up traffic but thankfully the collision between a Ford Mondeo and a lorry was damage only and there were no patients. Tuesday 22nd September 2015 – 4.30pm – Chris Kowalik. 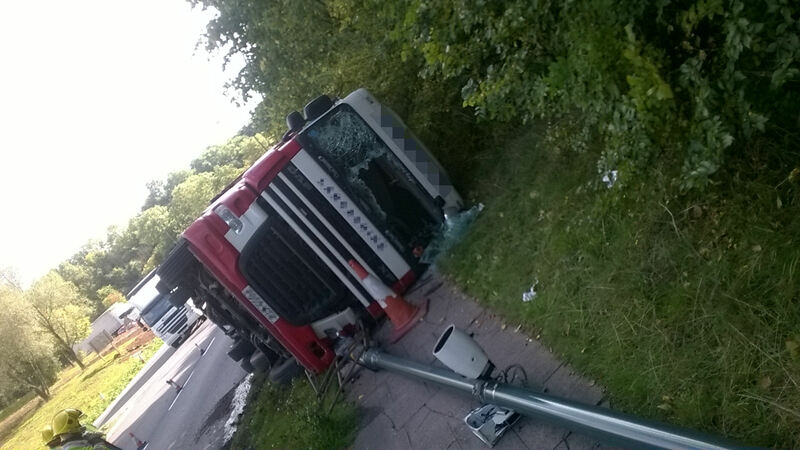 The driver of this lorry (pictured) has suffered many, albeit minor, cuts after it ended up on its side. He’s been taken to hospital but the vehicle is expected to remain at the scene for some time. West Midlands Ambulance Service was called to the A452 at its junction with Newport Road, Castle Bromwich shortly after 2.30pm today. An ambulance crew and a paramedic area support officer in a rapid response vehicle attended. A West Midland Ambulance Service spokesman said: “The driver, a man in his forties, managed to get himself out of the cab. Tuesday, 22nd September – 3.45pm – Jamie Arrowsmith. 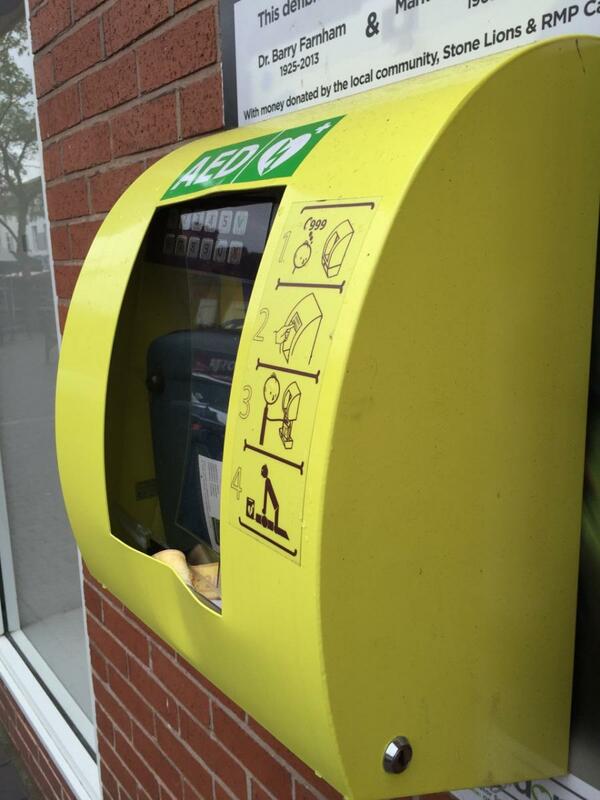 A defibrillator that has the potential to save lives has been taken out of 24/7 use in a Staffordshire town after damage caused by vandals overnight. 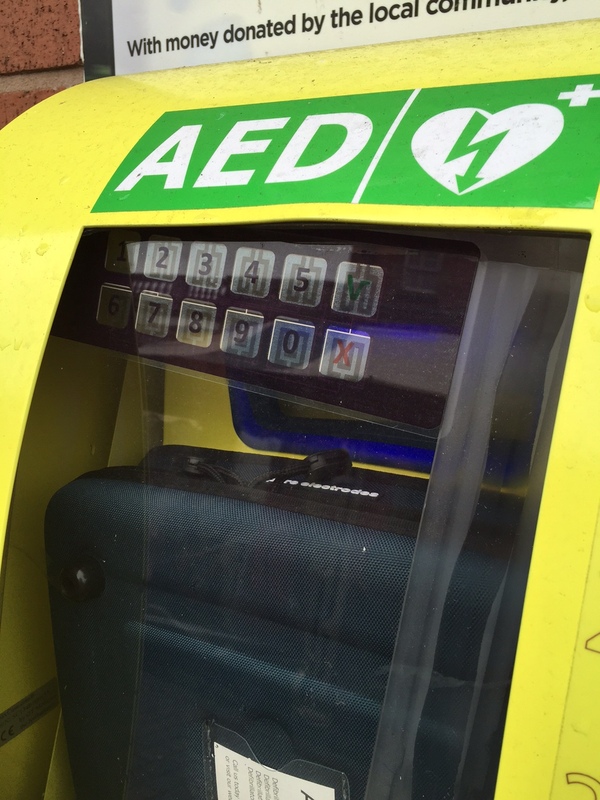 Based outside the Co-op on High Street, Stone, the cabinet that protects the defibrillator has been damaged in two places which has resulted in the life-saving device being left open to the elements and the keypad that is used to access it partly inaccessible. As a result, the defibrillator is now having to be kept inside the Co-op and therefore is only available for the community to use whenever the store is open. West Midlands Ambulance Service Community Response Manager Matt Heward, said: “It is extremely disappointing to discover the damage that has been caused and the fact the defibrillator is not going to be available around-the-clock. It is not yet known how long it will take to replace the cabinet and have the defibrillator available 24/7 again. “Defibrillators are there in the event of someone having a cardiac arrest; when they stop breathing and their heart stops beating,” Mr Heward added. Tuesday 22nd September 2015 – 2.30pm – Claire Brown. A hamlet in Worcestershire had a ‘shock’ from the ambulance service during a fundraising breakfast earlier this month. The small hamlet of Harpley held its annual fundraising breakfast at St Bartholomews Church on Saturday 12th September to raise funds for a good cause. This year, the church decided to raise money to help purchase an automated external defibrillator; a device used to help restart the heart of someone in cardiac arrest. 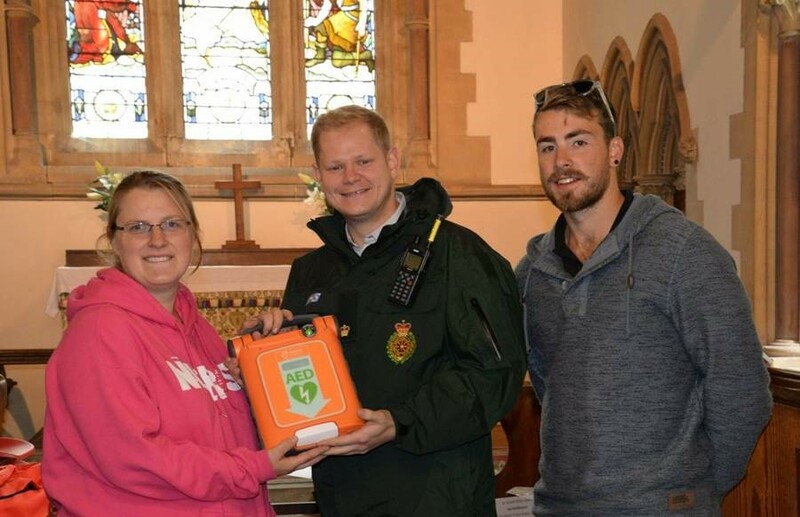 Ben Rean, a Worcester University Student Paramedic currently working with West Midlands Ambulance Service, recently got married at the Church and was keen to support the event by bringing along a senior ambulance manager to talk more about the benefit of defibrillators. Following a hearty breakfast, the 80 attendees were literally shocked when the ambulance manager presented the hamlet with their very own device for free. The money raised at the breakfast will now, instead, go towards a secure defibrillator box to house the lifesaving device. Pictured (L-R): Liz Young, Adam Layland and Ben Rean. Tuesday 22nd September 2015 – 1.00pm – Claire Brown. 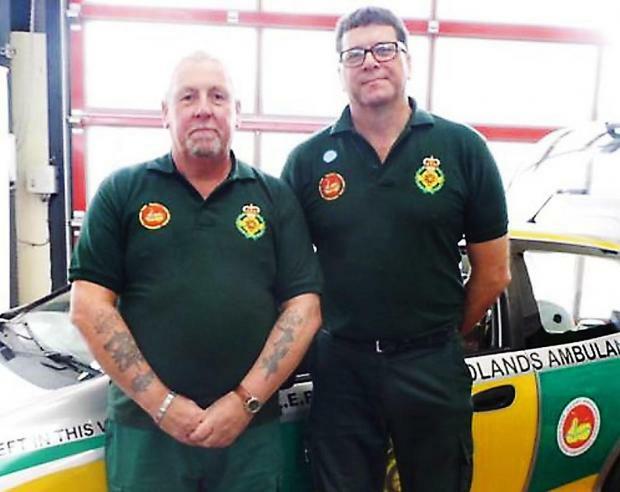 Two volunteer life savers had a shockingly successful first shift recently in Solihull. Recent recruits Lizzie Hobday and Sarah Wilson worked their very first shift as Fastaid Birmingham and Solihull Community First Responders (CFRs) at the start of September and, three 999 calls in, they ended up saving a man’s life. CFRs are members of the public from all walks of life who give up their spare time to help make a difference in their communities. All are trained by West Midlands Ambulance Service to a nationally recognised level and help to reach those people suffering from medical emergencies prior to the arrival of an ambulance. Sarah and Lizzie began training to become CFRs in June and became fully operational at the start of September. 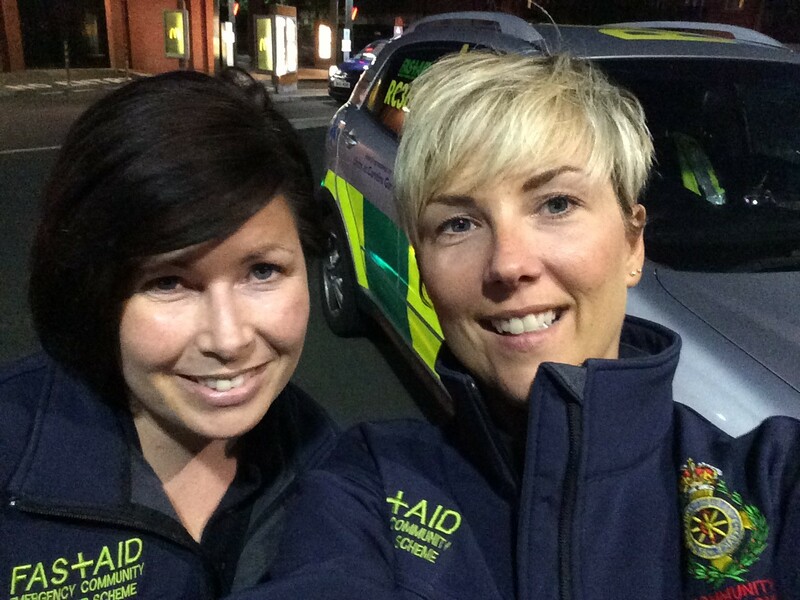 A selfie photograph of Sarah (left) and Lizzie (right) during their first shift. Tuesday 22nd September 2015 – 6.37am – Murray MacGregor. 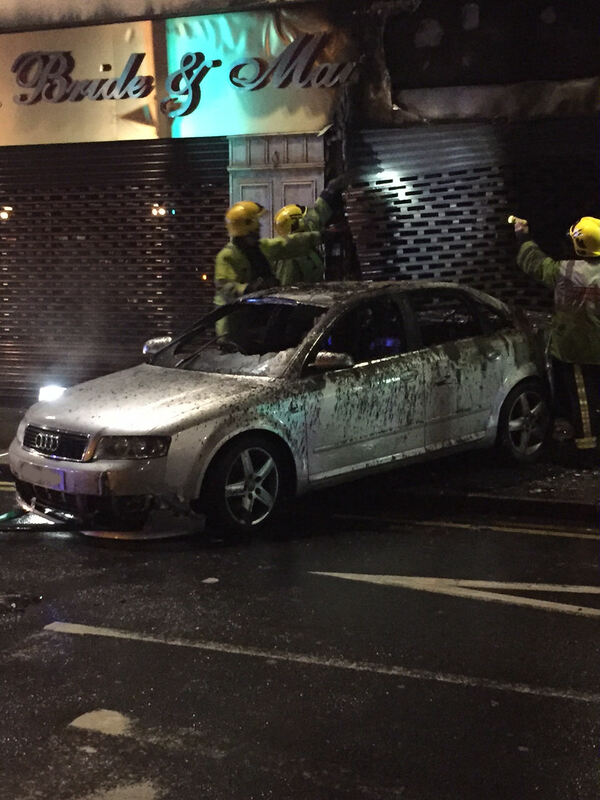 Ambulance crews who attended the scene of a crash that saw a car burst into flames after a smashing into a shop are appealing for those in the car to seek medical help. The call comes after a call to the junction of Ladypool Road / Oldfield Road in the Balsall Heath area of Birmingham at just after 3.10am on Tuesday morning. 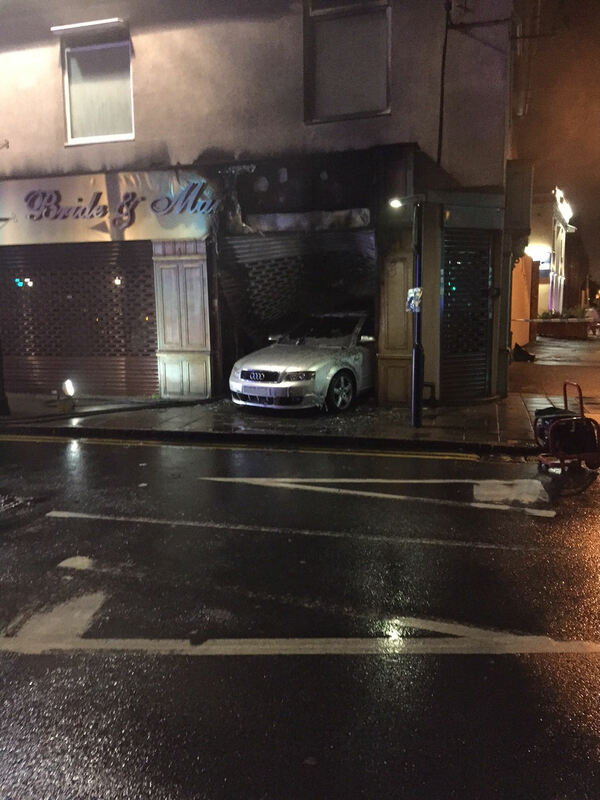 When the ambulance and paramedic area support officer arrived on scene, they found a car on fire in a shop unit. The car also had damage to its roof. A West Midlands Ambulance Service spokesman said: “Given where the car ended up and the level of damage, we have serious concerns for whoever was inside it when it crashed. There was no-one at the scene. No-one was in the property above the shop unit. Monday 21st September 2015 – 7.10pm – Murray MacGregor. A young lad has received advanced trauma care at the scene of a collision with a car after suffering a nasty leg fracture. 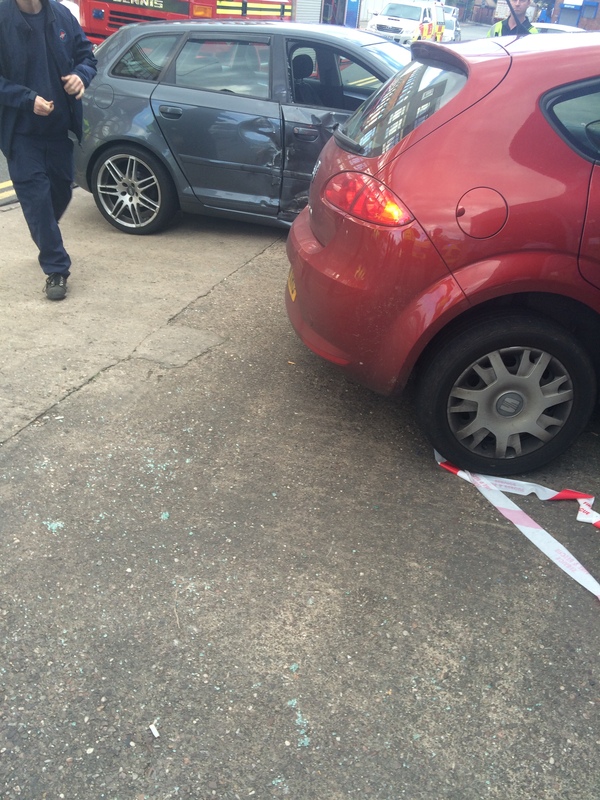 The crash happened in Stratford Road in the Sparkhill area of Birmingham at around 4.30pm. The eight year old was crossing the road with his mother when the collision happened. An ambulance, a paramedic area support officer and the Midland Air Ambulance from Cosford were sent to the scene. A West Midlands Ambulance Service spokesman said: “The youngster had suffered a very badly broken left leg and some minor abrasions to his face. “He was given advanced pain relief by the doctor from the air ambulance before his leg was treated. “He was then taken on blue lights in a serious condition to Birmingham Children’s Hospital with the doctor travelling with the land crew. Monday 21st September 2015 – 6.50pm – Murray MacGregor. The quick actions of an off duty paramedic have helped save the life of a passenger who was choking whilst on board a train. An emergency call was put out on the tannoy of the Virgin Trains Liverpool to London service as it stopped at Stafford Station at about 1.45pm this afternoon, Monday. The man, who was in a first class carriage, had stopped breathing and was becoming hypoxic from a lack of oxygen after eating a sandwich. North West Ambulance Service paramedic Paul Jones jumped out of his own carriage and ran along the platform to where the patient was to find another passenger trying CPR on the man. After quickly assessing the choking man’s condition, he used abdominal thrusts, back slaps, finger sweeps and manipulated the man’s throat until a large chunk of food came out; this allowed the passenger to breathe slightly. At this point an ambulance crew and rapid response vehicle arrived, three minutes after the 999 call. 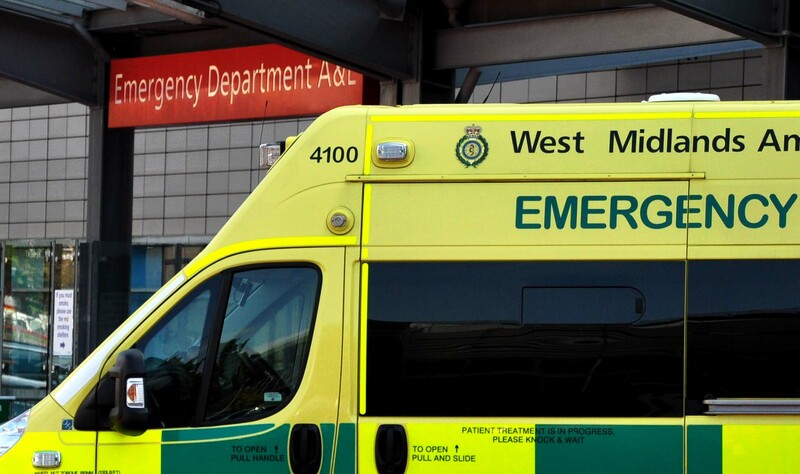 The three West Midlands Ambulance Service staff worked with Mr Jones to continue treating the man, clearing his throat completely and giving him oxygen. The man, who was in his 50s, was then taken off the train and driven by ambulance on blue lights the short distance to County Hospital, Stafford. A West Midlands Ambulance Service spokesman added: “There is no doubt that the early intervention of Mr Jones and the other people in the carriage has given this man the best possible chance of survival. Dozens of lives saved across 5,000 jobs – could you become the next lifesaver? Monday 21st September 2015 – 12.50pm – Jamie Arrowsmith. A Community First Responders (CFRs) group is celebrating ten years of saving lives by launching an appeal for new members. Ashley and Loggerheads CFRs has responded to almost 5000 jobs in that time, saving dozens of lives along the way. As the group starts looking towards the next ten years, it is appealing for new members to come forward and join it to help boost numbers within its ranks. When the group formed it had 20 members but in the years that have passed, some have moved on to other areas, left the country or retired. As a result just four responders are left with three more about to start their training. CFRs are members of the public from all walks of life who give up their spare time to help make a difference in their communities. All are trained by West Midlands Ambulance Service to a nationally recognised level and help to reach those people suffering from medical emergencies in the remote rural communities fast, prior to the arrival of an ambulance. In many illnesses or injuries the first few minutes are critical and simple interventions can be performed in order to save lives or prevent disability. 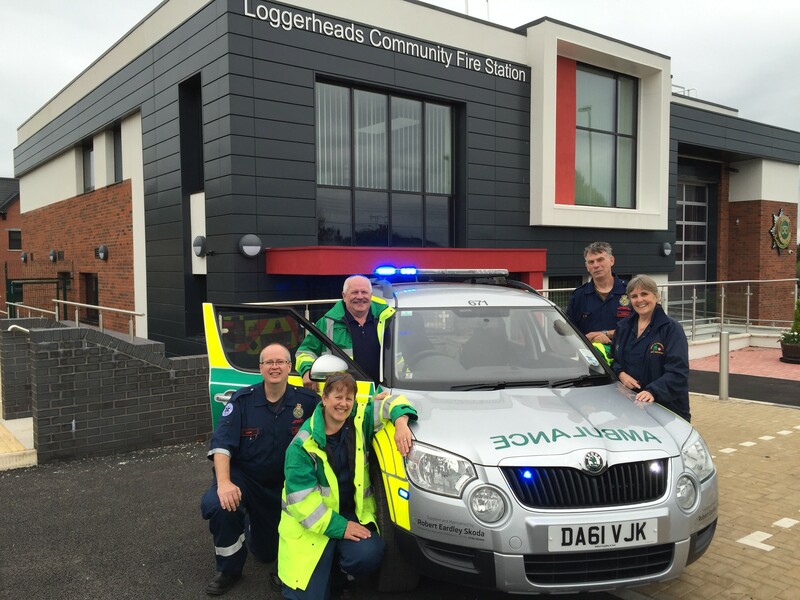 Ashley and Loggerheads CFR co-ordinator, Mark Pepper, said: “We are extremely proud of the work we have done over the last ten years and all of the lives we have saved. “It is a significant moment for the group to reach ten years of service and we look forward to carrying on, hopefully with more people volunteering to come and join us. CFR groups rely on charitable donations and fund-raising, therefore if you cannot spare the time to join as a responder, but would like to assist with raising money, the group is also keen to hear from you. Email coordinator@alcfr.co.uk for more information regarding joining the group as a responder or as a fund-raiser. Picture caption (l-r) Ashley and Loggerhead CFRs – Mark Pepper, Debbie Cooper, Damian Murphy, Jeff Love and Val Kennett. Sunday 20th September 2015 –7.06pm – Murray MacGregor. Two drivers have been assessed by ambulance crews after a collision that left one car in a hedge and the other in a field. 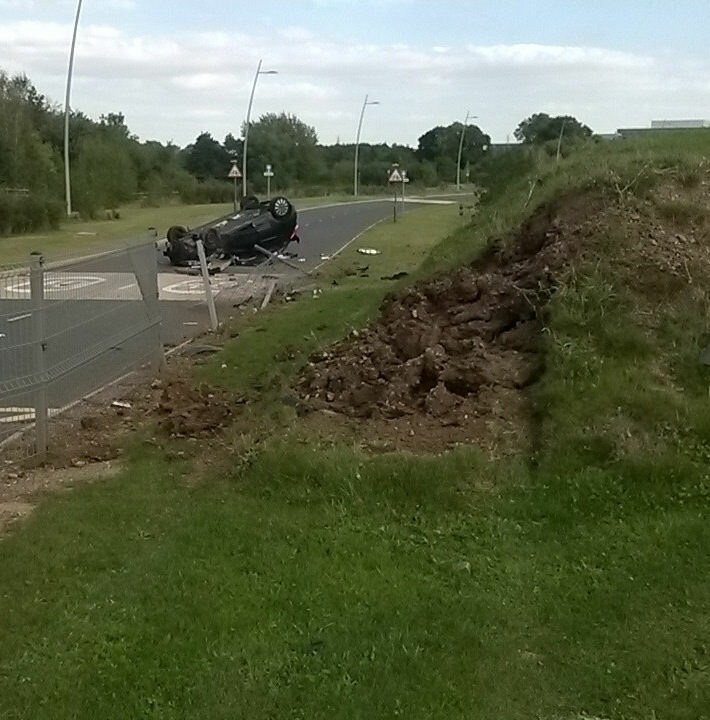 The crash in Wheat Leasows, Telford happened at about 5.40pm on Sunday afternoon. When ambulance crews arrived, they found a red Mini rear end into a hedge. The woman driver was lying across the front seats, disorientated and complaining of neck and back pain. After being assessed by ambulance staff at the scene, she was taken by land ambulance to Royal Shrewsbury Hospital. A man driving the black Audi was more fortunate. Despite his car ending up in a field, minus a wheel which was still in the road, he escaped injury. He was assessed by ambulance staff but did not need hospital treatment. In total, two ambulances, a paramedic area support officer and the Midlands Air Ambulance from Cosford were sent to the scene. Sunday 20th September 2015 – 6.18pm – Murray MacGregor. The incidents happened right across the West Midlands. The first, at just after 11.00am, happened just off Moors Lane in Feckenham, Worcestershire. The woman in her 50s was stood on by her horse which caused her to fall awkwardly causing back, hip and shoulder pain. A rapid response vehicle and ambulance were initially responded but due to her condition, they requested an air ambulance to provide advanced pain relief. 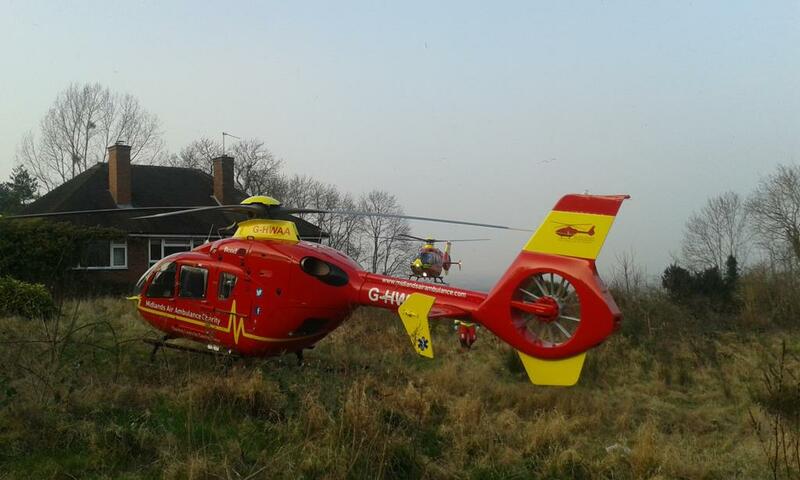 After further treatment she was taken by land ambulance to the Alexandra Hospital in Redditch. The second incident at 1.25pm in a field off Walsall Road, Muckley Corner near Lichfield happened at lunchtime. A woman in her 50s was riding a horse when it reared up causing her to fall and then the animal fell on top of her. A rapid response vehicle was first on scene and the paramedic treated her for a suspected fractured leg, splinting it and providing pain relief. Due to the location, the Midlands Air Ambulance from Staffordshire was sent to airlift the woman to New Cross Hospital in Wolverhampton. The last horse injury came at just before 2.30pm after the 16 year old rider was unseated and then had the horse land on her chest. 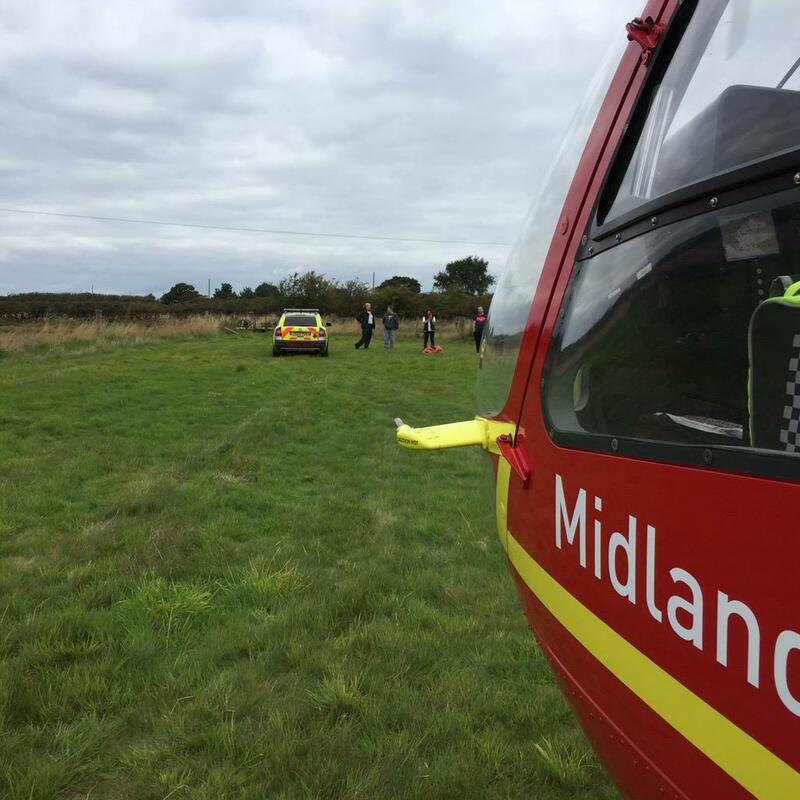 The incident in a field near Upper Tysoe in Warwickshire resulted in the girl suffering chest and abdominal pain. 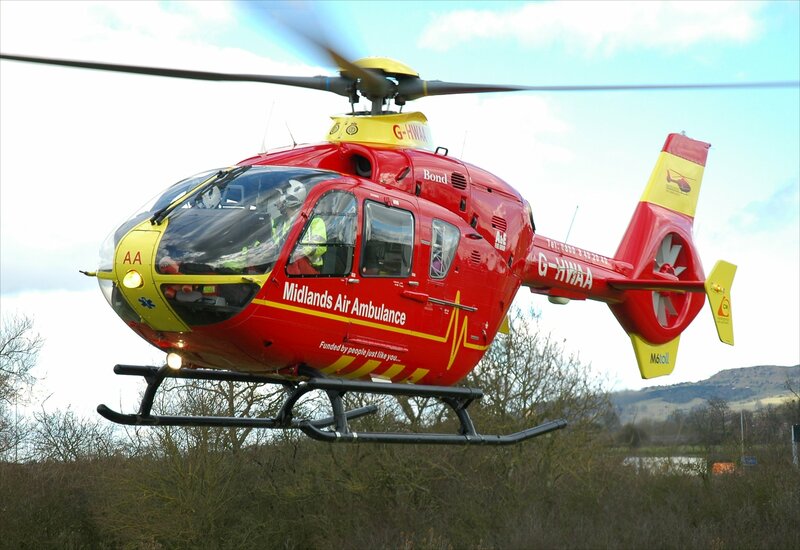 The ambulance crew had treated her on the scene immobilising her as a result of the nature of the injury before the Warwickshire and Northamptonshire Air Ambulance arrived to transport her to University Hospital Coventry & Warwickshire. Sunday 20th September 2015 – 8.45am – John Hawker. A 999 call was received this morning to the M40 southbound, between junction 15 and 16, to reports of a serious RTC following a car travelling the wrong way on the motorway. Two ambulances and a paramedic officer attended the scene at 6.15am this morning. It was very foggy when crews arrived at the incident. 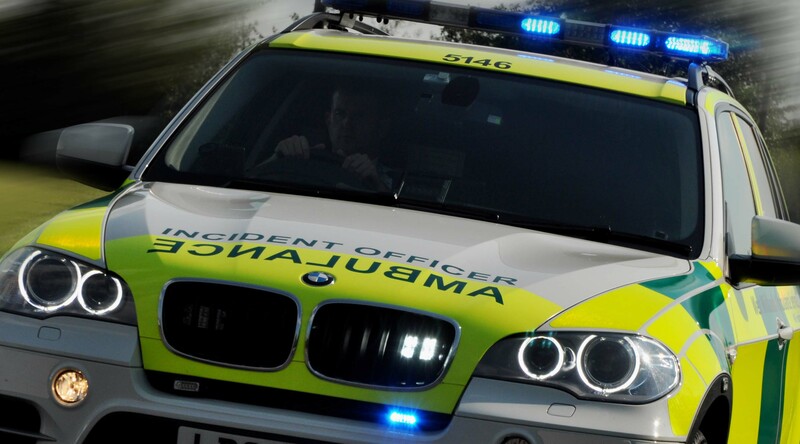 A West Midlands Ambulance Service spokesman said: “Crews arrived to find a car that is believed to have mistakenly joined the motorway the wrong way and subsequently been in a serious collision with two other vehicles. “The car believed to be travelling the wrong way, driven by an elderly gentleman, came to rest up a grass embankment following the crash. The man had suffered a small head laceration, further minor injuries and was shaken up. He was treated at the scene by medics and with the doors of the vehicle unable to be opened was released by the Fire Service. “Once out, the man received further treatment by ambulance crews and due to the mechanism of the crash was transferred to University Hospital Coventry and Warwickshire for further checks. “The occupants of two further vehicles involved in the crash, a man in his 40’s and a man in his 50’s, were both checked over by ambulance crews but were uninjured and discharged. Saturday 19th September 2015 – 10.25pm – John Hawker. A woman has been seriously injured after the car she was travelling in overturned on the M5 this lunchtime. 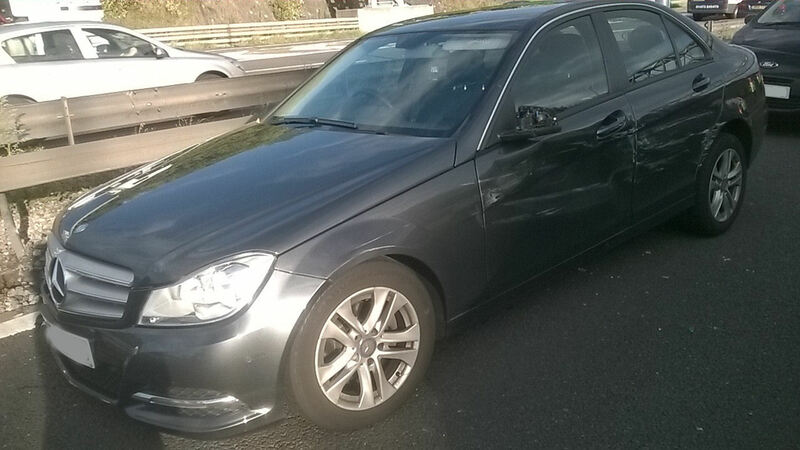 The crash occurred on the M5 between junctions 6 and 5 Southbound, Droitwich Spa, at around 12.25pm. A rapid response vehicle, an ambulance and a paramedic officer attended the scene. A West Midlands Ambulance Service spokesman said: “Crews arrived to find a car that had overturned after a two vehicle RTC. “The woman travelling in one car, believed to be in her 30’s, suffered a head injury in the crash. She received emergency treatment at the scene by medics and her condition was stabilised. “The woman was then transferred by ambulance to Worcester Royal Hospital for further emergency treatment. Saturday 19th September 2015 – 7.40pm – John Hawker. A man has died following an incident at industrial premises in Cannock this afternoon. A 999 call was received to a man that had fallen through a roof at an industrial premises in Norton Green Lane, Norton Canes at around 2.25pm. Two ambulances, a paramedic officer, the Trusts Hazardous Area Response Team and two Midland Air Ambulances attended the scene. A West Midlands Ambulance Service spokesman said: “Crews arrived to find a man who is believed to have fallen through a roof to the ground below. The man had suffered serious injuries and was in traumatic cardiac arrest. Saturday 19th September 2015 – 7.15pm – John Hawker. Two teenagers had a miraculous escape this morning after the motorbike they were riding was in collision with a bus in Birmingham. 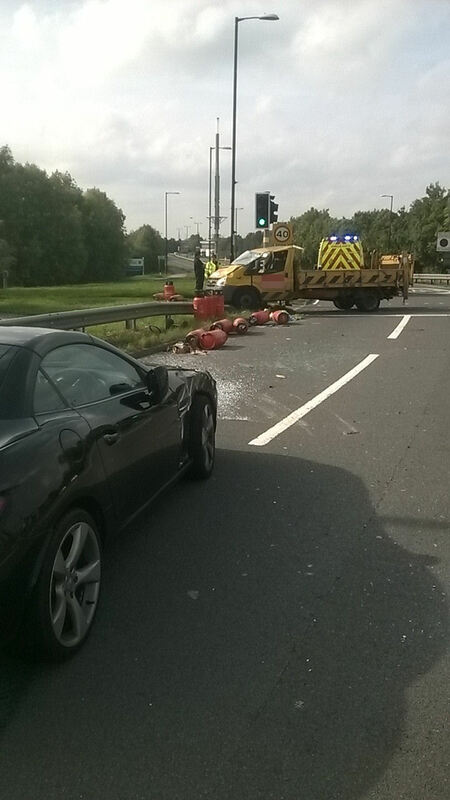 The crash occurred at the junction of Longdales Road and Bracken Way, Kings Norton at around 9.35am. Two ambulances, a rapid response paramedic and a paramedic officer attended the scene. 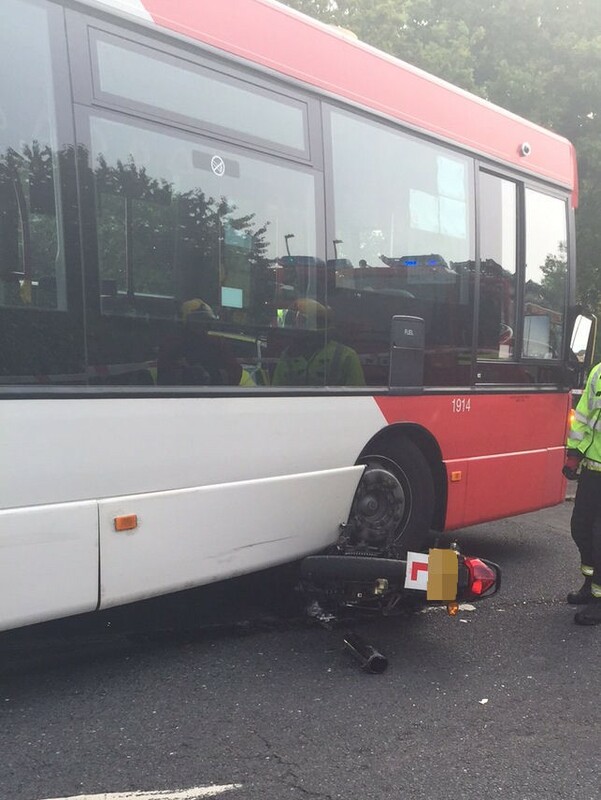 A West Midlands Ambulance Service spokesman said: “Crews arrived to find a motorcycle that had been in collision with a bus and was trapped underneath it. “Unbelievably, the two teenage boys who had been on the bike at the time of the crash had only suffered relatively minor injuries, despite not wearing any safety equipment at all, including helmets. “A fifteen year old was treated by medics for neck, back and pelvic pain and an eighteen year old was treated for shoulder, pelvic and back pain. Both men were transferred by land ambulances to hospital for further treatment; the fifteen year old to Birmingham Children’s Hospital and the eighteen year old to Queen Elizabeth Hospital. Saturday 19th September 2015 – 9.15am – Jamie Arrowsmith. 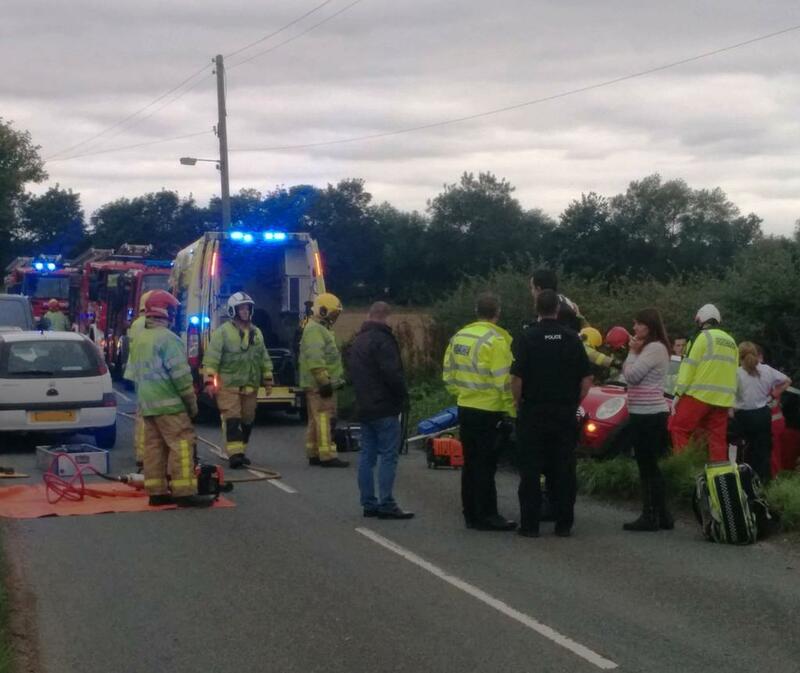 A motorcyclist has died following a collision with a telegraph pole in the early hours of this morning. The incident happened on Burton Road in Branston, Burton-on-Trent, shortly before 4.30am and West Midlands Ambulance Service sent an ambulance, a community paramedic and a paramedic area support officer to the scene. 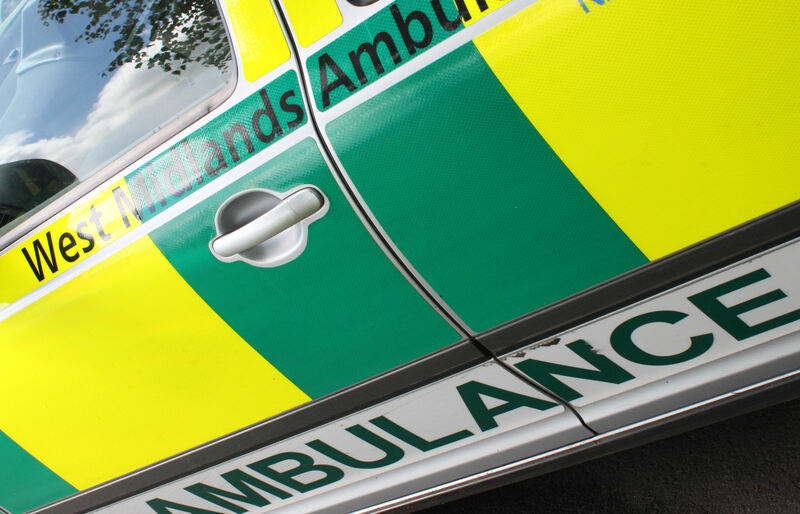 A West Midlands Ambulance Service spokesman said: “Crews arrived to find a man who had come off his motorbike following a collision with a telegraph pole. “Unfortunately it quickly became apparent that nothing could be done to save him due to the nature of his injuries and he was confirmed dead at the scene.